Towards the end of the last war, a whole series of reports were commissioned into the rebuilding and development of the City of London. These reports used the opportunity for major reconstruction to propose significant change and to address the needs that the City would be expected to support in the future. I have already written about a number of these reports, including the 1944 report on Post War Construction in the City of London, the 1943 County of London Plan and the 1944 Railway (London Plan) Committee report. For this week’s post I would like to cover another report, covered in a book that documented proposed redevelopment of the City of London. 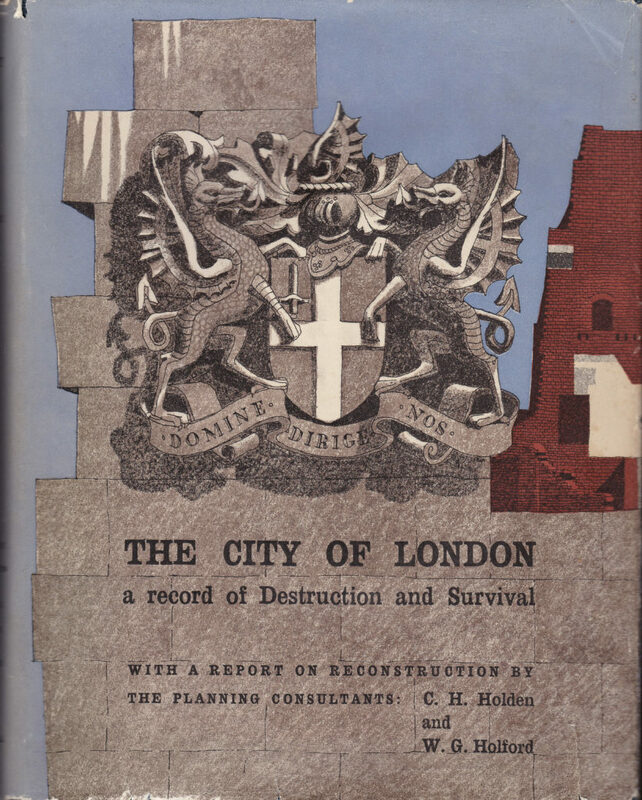 This was published in 1951 by the Architectural press, on behalf of the Corporation of London as the City of London – a record of Destruction and Survival, with a report on reconstruction by the planning consultants C.H. Holden and W.G. Holford. The 1951 book is far more comprehensive than the earlier reports. It includes a detailed historical background to the City of London, including a chronological table and describes in detail the war damaged areas. There are numerous statistical details and plenty of maps overlaid with detail on the pre-war City and future plans for the City. Reading the book in 2019 also demonstrates the difficulty in making long term plans. Unforeseen events frequently resulted in an expected future trend becoming obsolete. 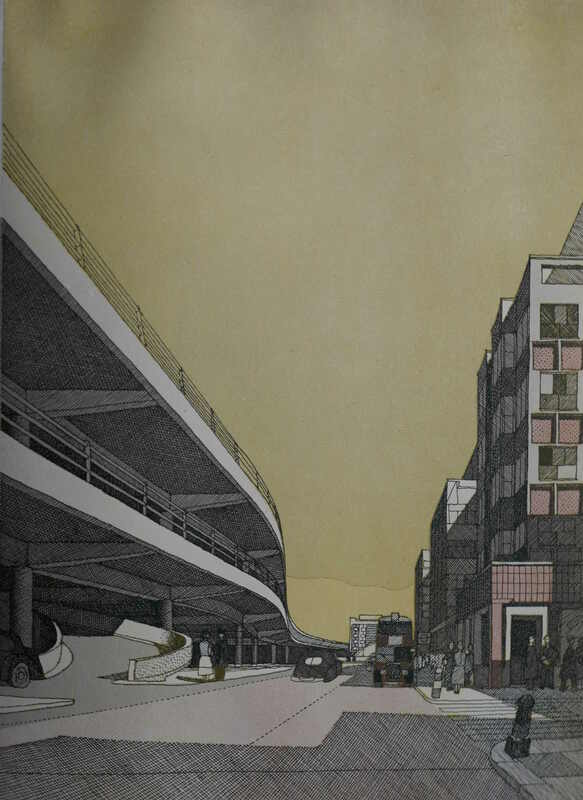 The book includes many proposals that we can see around the City today, some looking remarkably modern for their time. Other proposals, thankfully, did not get implemented as they would have left a significant architectural and visual scar on the City. Yellow is General Commercial and takes up large parts of the City. The area along the river is still dominated by Wharfs and the Billingsgate Fish Market. Textiles take up the area from around St. Paul’s Cathedral and up to the north of the City. 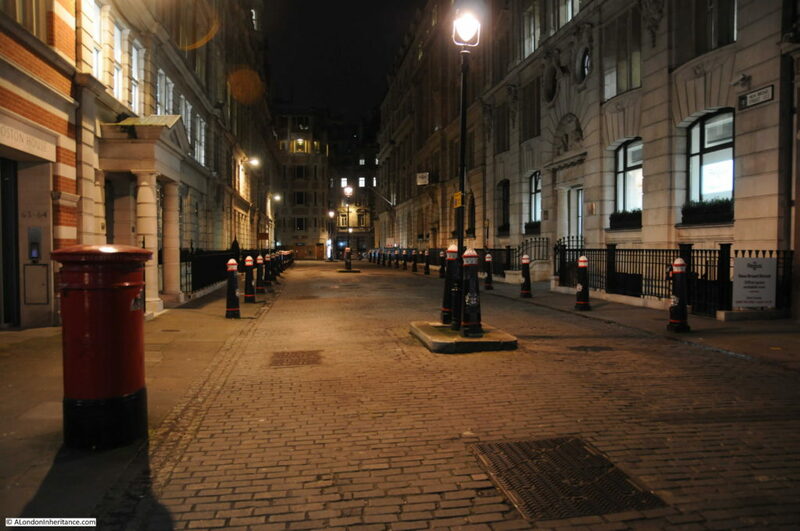 The Press and Printing surrounds Fleet Street. 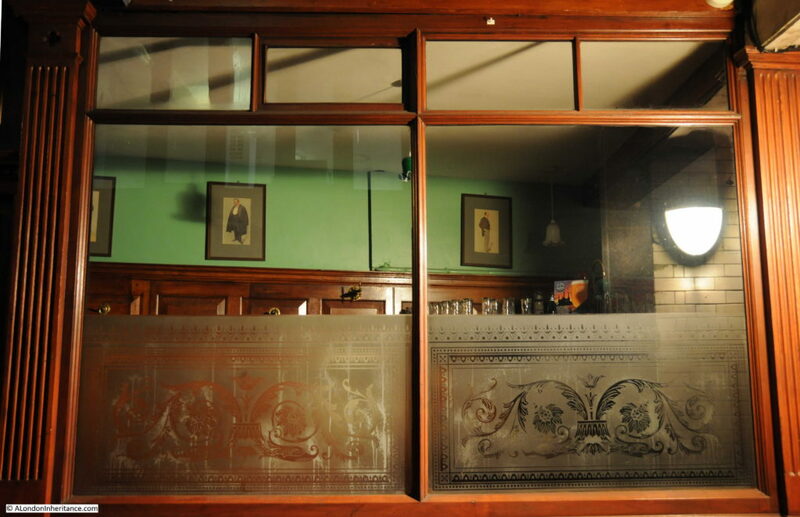 There are smaller concentrations of specialist trades – Chemists Supplies, Books, Wines & Spirits. Railway Warehouses and Clothing Warehouses occupy the east of the City. At first glance the map is much the same as pre-war, however there are some subtle differences. Wharfs still occupy the river bank, but the fish market has moved. Chemist Supplies has disappeared from the City. 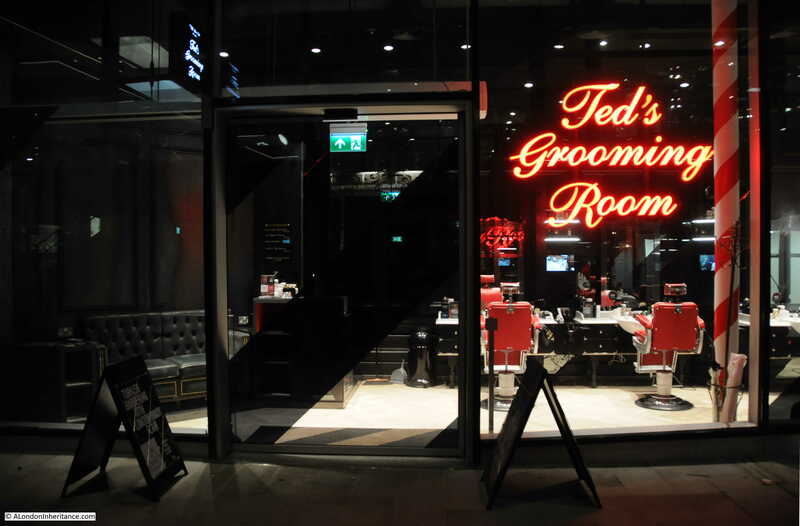 In the north of the City a much larger area has now been allocated to Commercial and Light Industrial, reducing the area for Textiles, Furs & Skins – the expectation was that new Light Industrial businesses would start to replace some of the traditional City trades. 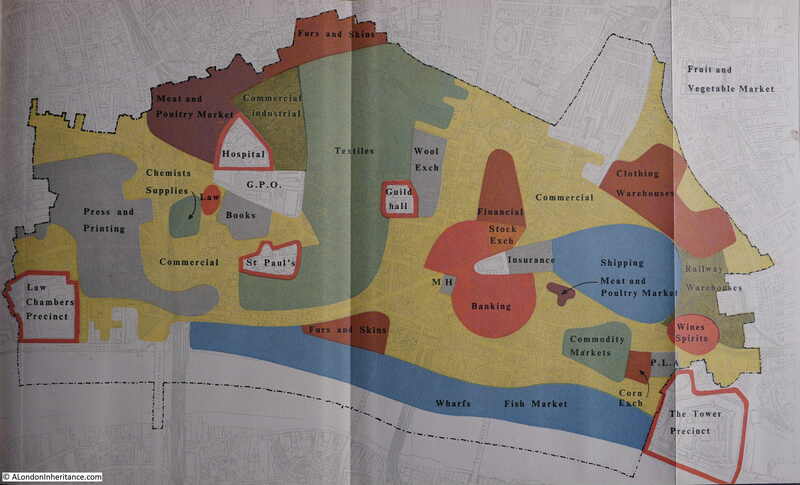 Apart from these relatively small changes, the immediate post war planning expected the trades that would occupy the City would continue to be much the same. Cargo ships and Lighters would still moor along the wharfs, textiles would occupy a large part of the City as would the Press and Printing. The following 30 to 40 years would transform the trades and activities of the City far beyond the expectations of 1951. Another map looked at the Inventory of Accommodation within the City. By comparison, the latest City of London Housing Stock Report (December 2018), does not report on the amount of accommodation floor space, rather the number of residential units in the City of London (7,240) along with the split of these residential units by the number of habitable rooms. 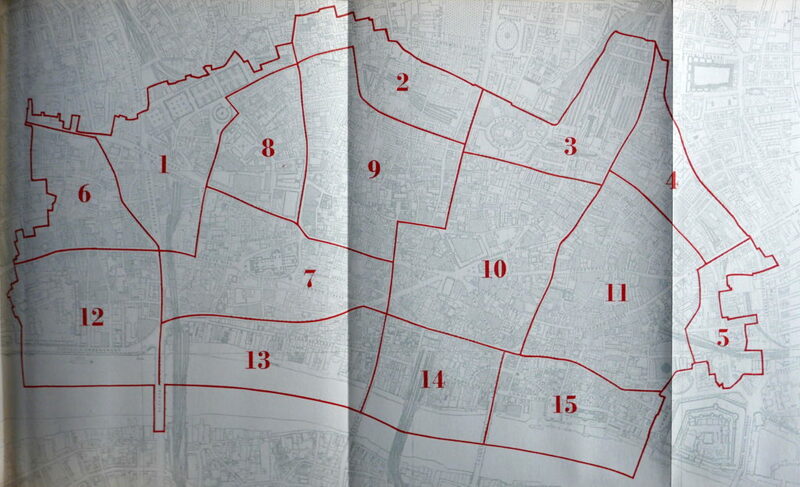 The map also highlights the considerable amount of damage caused by the early raids of 1940 / 41 when incendiaries caused significant fire damage in the areas around and to the north of St. Paul’s Cathedral as shown by the high percentage figures for blocks 2,7 and 9. A key focus of the report was the support of pedestrian and vehicle traffic throughout the City. 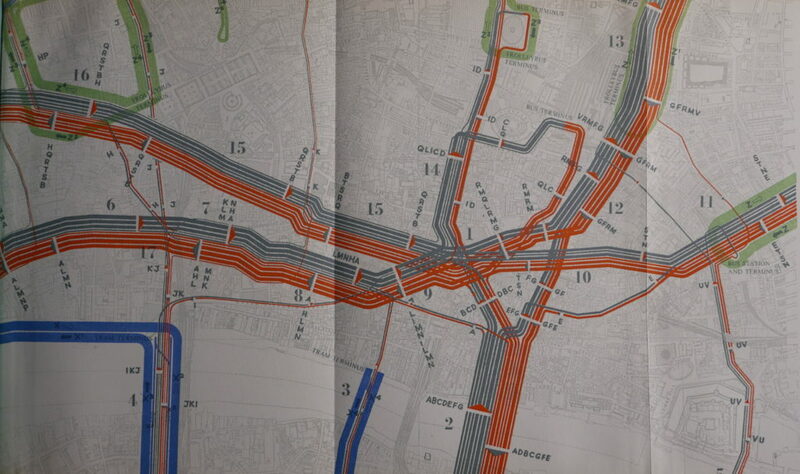 New boundary routes were proposed to the north and south of the City to support traffic passing through the City to get between east and west London and across the river. Plans also included widening of streets, new streets driving across existing street and buildings and elevated sections for roads. High and low level separation of pedestrians and vehicles was seen as the way forward for the City. 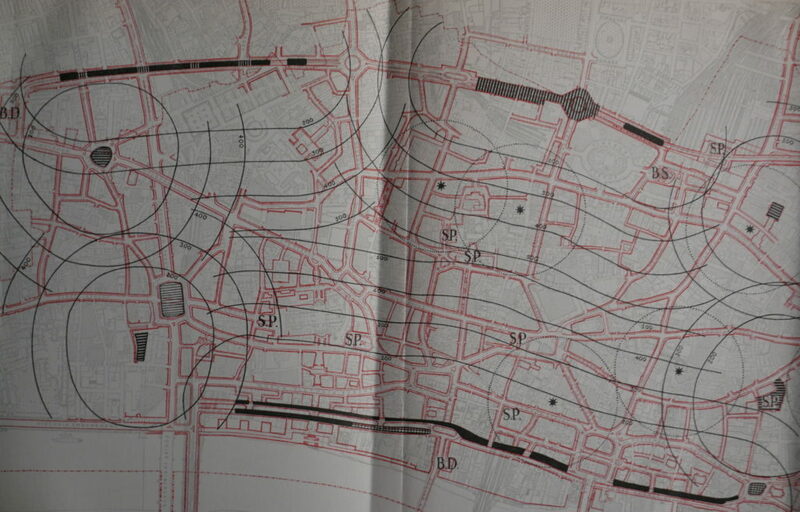 Two main areas where this would apply would be the northern boundary route along Holborn to Aldersgate and the south route along Thames Street. The following map shows where improvements or changes would be made, marked by the streets in red. The book includes many artist impressions of what the proposed developments would look like. 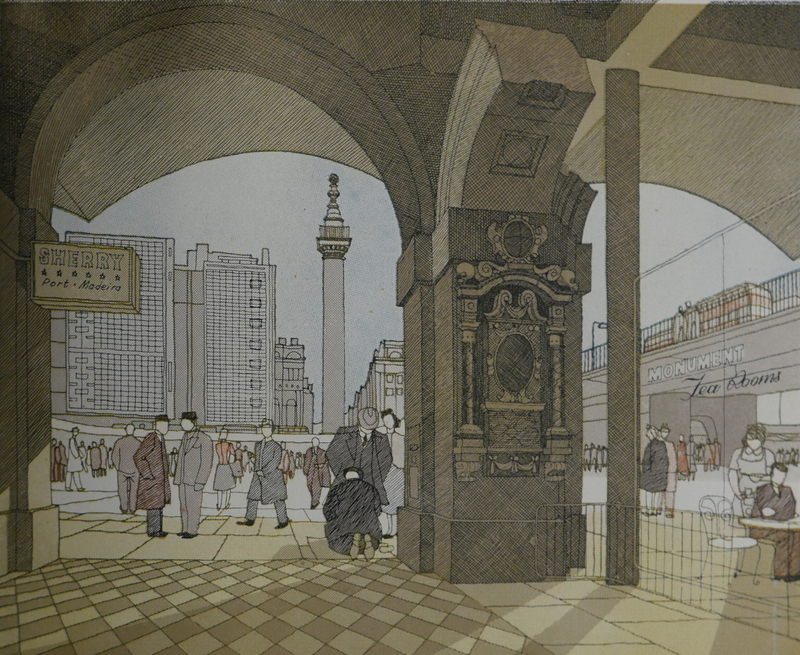 The following drawing show the proposed high level road in Lower Thames Street, with ground level occupied with a service road and pedestrian area. The proposal for Lower Thames Street is very different to what was finally implemented, with a multi-lane road built at ground level by widening the original street. The level of traffic does not lead to a pleasant experience walking along the street today, and the artist impression above does look good, but the impact of a high level road would have destroyed the whole view of the street and I suspect would not have been wide enough to support the growth in the level of City traffic. 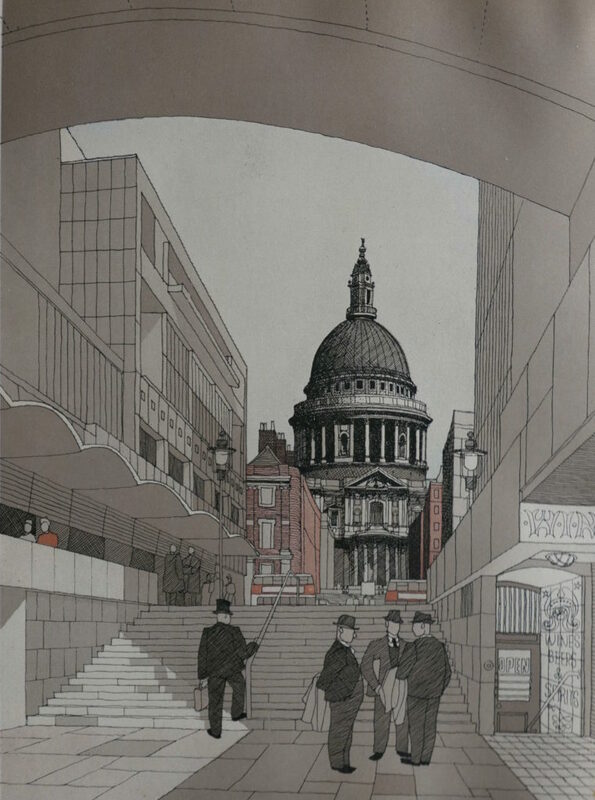 The book also goes into detail on the public utility services needed to support a city and aspects of street furniture which were all considered as part of the overall designs needed for improving the City’s streets for pedestrians and drivers. 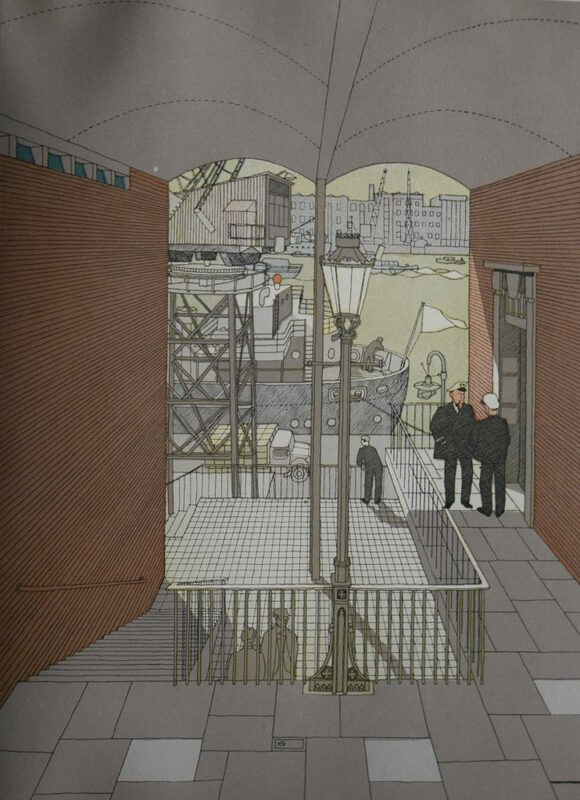 In describing how these utility services and street furniture would be implemented, the book includes the historical context, and as an example, the following illustration from the book shows the development of lamp standards from 1827 to 1946. 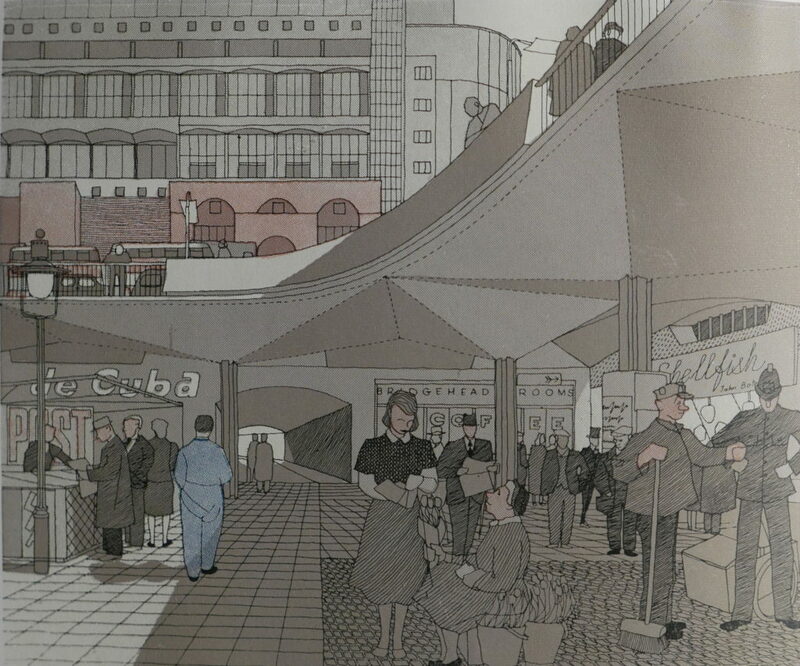 Continuing on the theme of pedestrianised areas, the book describes a number of options, supported by artist impressions for how traffic and pedestrians would be separated and large areas opened up for pedestrian circulation. 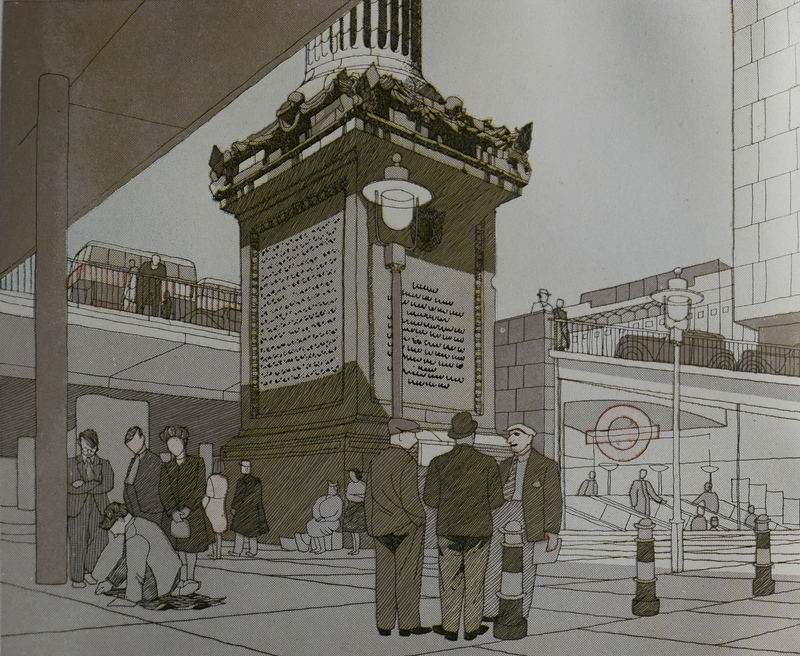 The following drawing is of the proposed low level concourse at London Bridgehead, just to the west of the Monument. 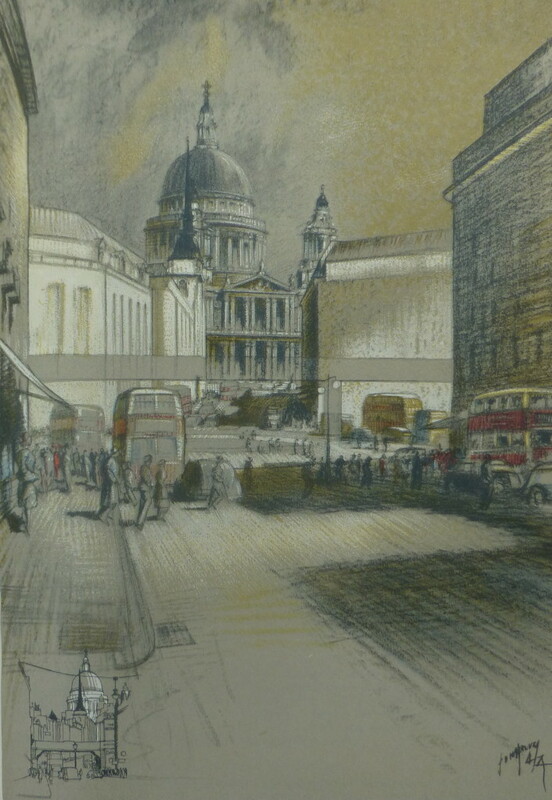 Although from a book published in 1950, I find these impressions of a redeveloped London curiously modern. 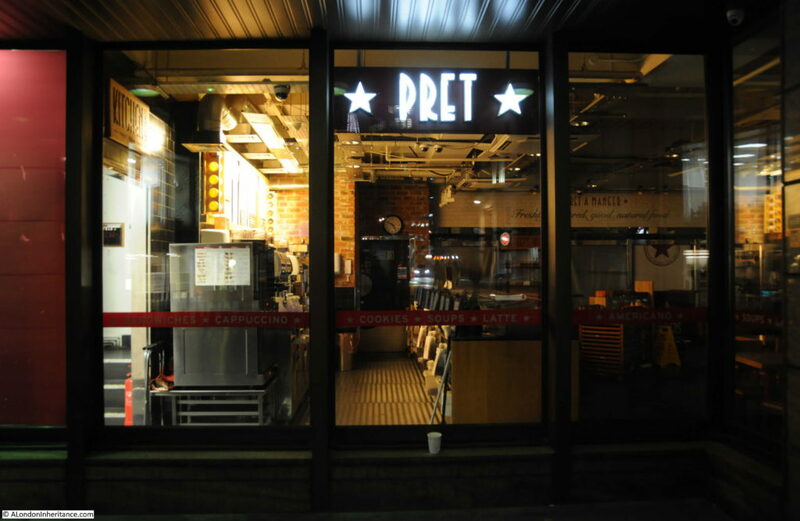 Change the name on the glass fronted Tea Rooms on the right to a Starbucks or Pret, change the Sherry sign on the left to Gin and update the clothes the people are wearing and this could be a proposal for today. 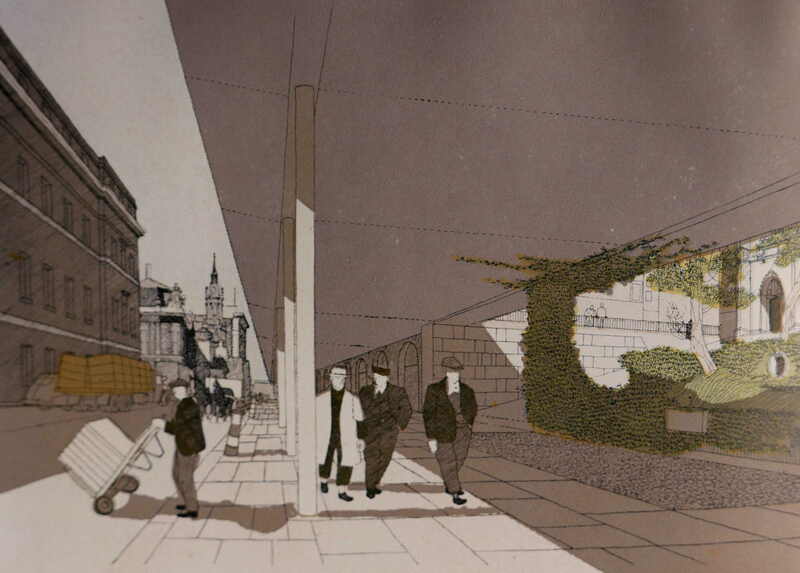 The following impression, also of the proposed London Bridgehead is again (apart from the clothes) rather modern. 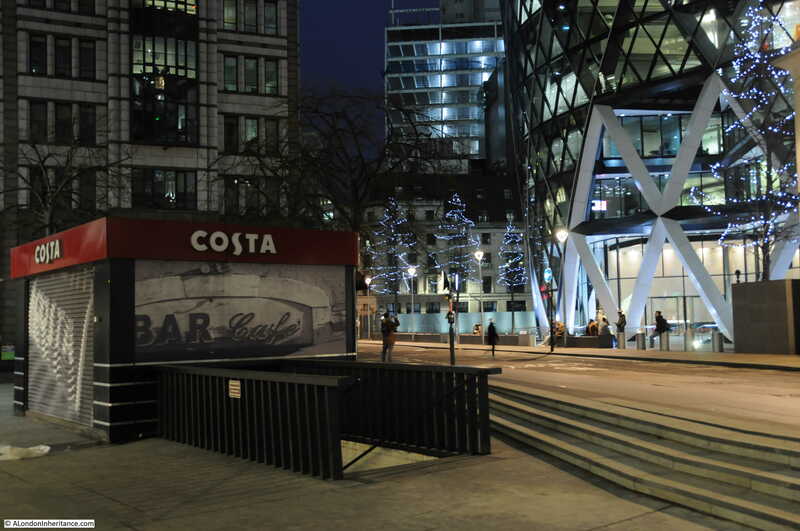 In many of these artist impressions there are cafes and restaurants shown lining the edge of the pedestrian areas. The proposals within the book see these as meeting a key need for City workers as “The City is chronically short of places to have lunch”. I suspect the authors would be rather pleased with the number of establishments in the City today to provide a worker’s lunch. The high level separation of traffic can be seen as part of the large circulatory road system on the northern end of London Bridge. 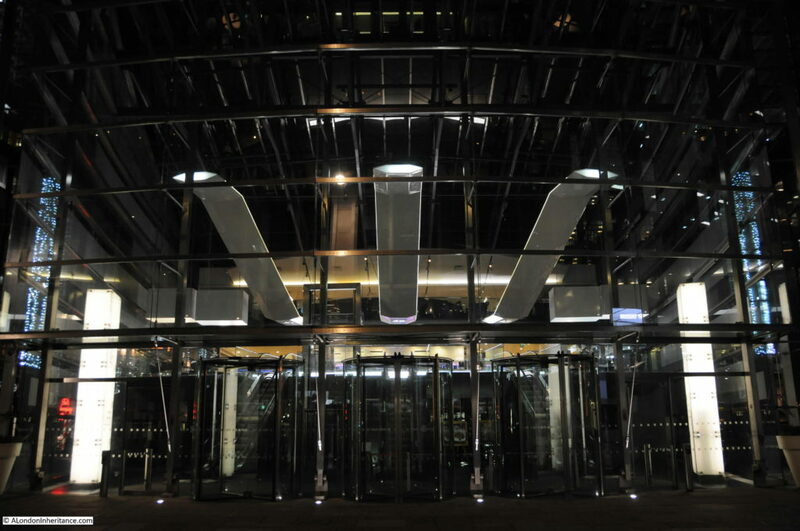 To the right is a glass sided entrance to the Monument Underground Station with the London Transport roundel on the side. This would have replaced the entrance on Fish Street Hill which today is an entrance directly on the ground floor of an office building rather than this rather nice, glass sided descent by escalator. 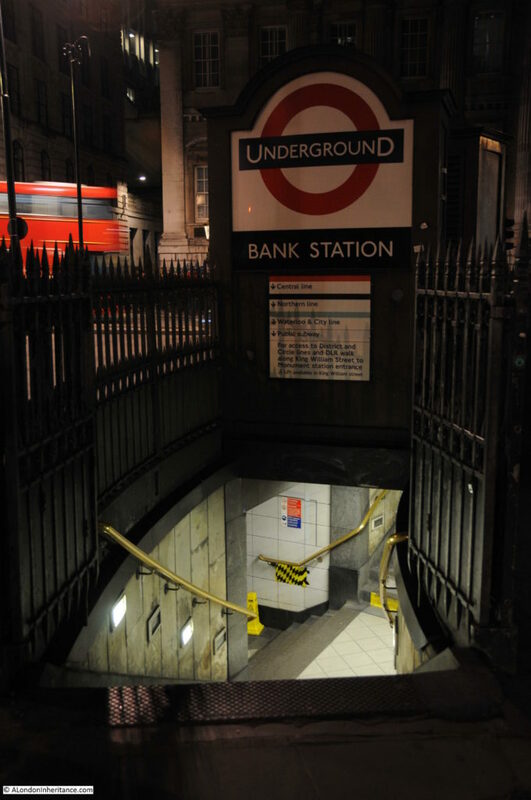 This type of entrance has been used at a number of Underground stations, one of the latest being a couple of entrances to the Tottenham Court Road Underground station. I was passing in the week and took the following photo – perhaps not so elegant as the 1951 plans, but such is the way of all artist impressions. 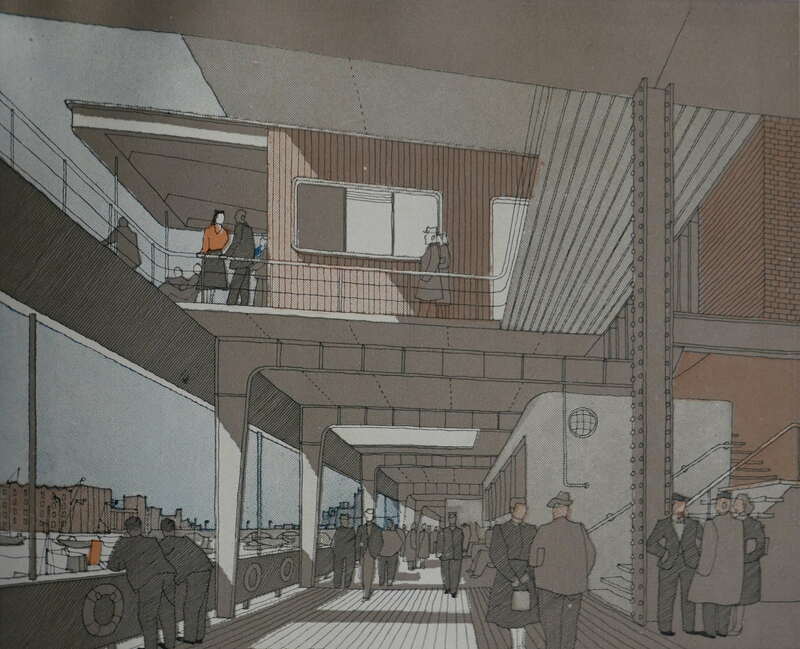 Proposals for developments along the river’s edge included terraced walkways along the river, with entrances between the warehouses opening up views to the river. The following drawing illustrates the proposals, but also shows how the proposals were not aware of the future changes to the use of the river, with shipping and cranes still expected to line the river. I love the artistic addition of the two men in some form of naval officers uniform. The comments about the riverborne goods, issues with cranes etc. 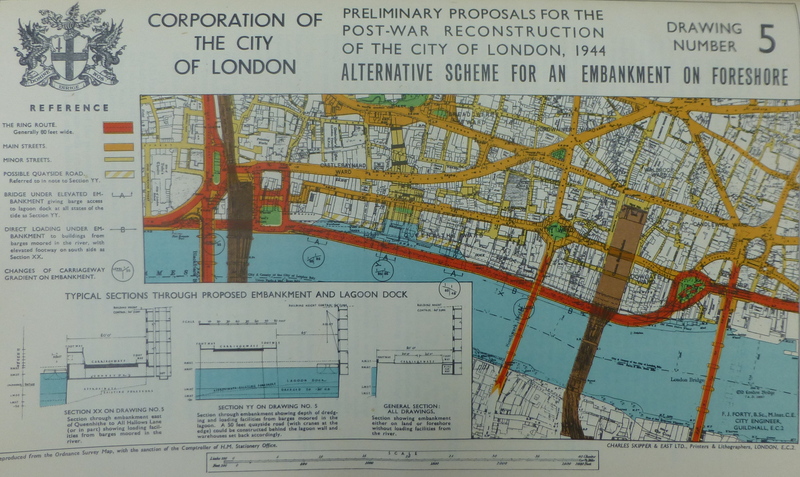 also show the difficulties with long term planning as those working on the 1951 plan were unaware of the changes that would take place to river traffic in the next few decades with not only the loss of all goods traffic, cranes and warehouses in the Pool of London, but also further down the river at the much larger docks. Who would be a city planner ? In improving the experience for pedestrians, the proposals including opening up views to the river as mentioned above. 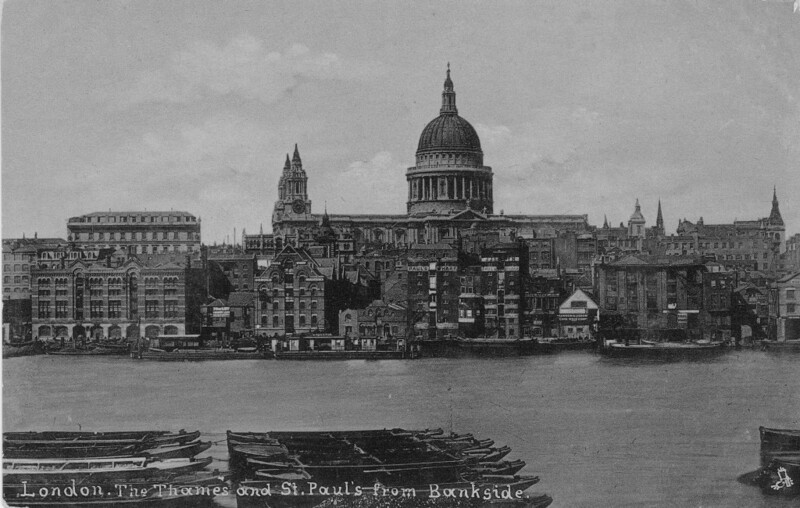 Another key view was that of St. Paul’s Cathedral to and from the river. 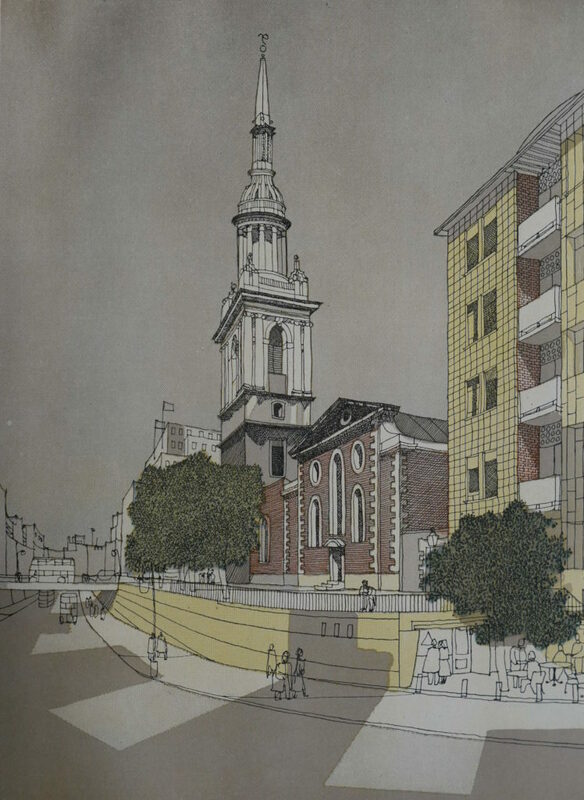 The development of this area has resulted in a view that is broadly similar to that proposed in the 1951 plan, although the buildings along the side are different and I suspect the width of the pedestrian walkway is today wider than the impression given in the drawing. The proposals so far, would have had a positive impact on the City, however other proposals, whilst for very good reasons would have been very negative and I am thankful that they were never built. Post war, continuation of pre-war growth in vehicle traffic was expected and proposals were included in the 1951 book to manage an increasing growth in motor traffic. 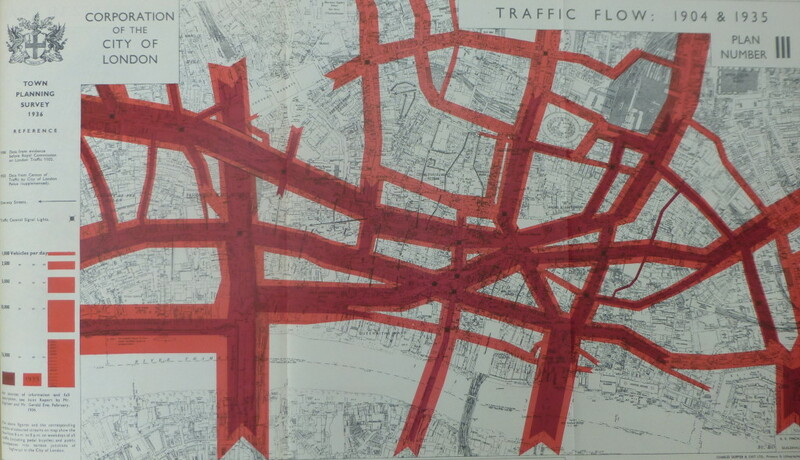 New through routes were planned for the south of the City along Lower and Upper Thames Street and a northern boundary route was proposed, cutting through numerous streets north of Smithfield and Finsbury Circus (see the map above with the red street highlighting). The book included artist impressions of what these developments could look like and they are frankly horrendous. Thankfully this was never built along the northern edge of the City and as its name implies, the Northern Boundary Route, would have indeed formed a solid boundary between the City and the land to the north. 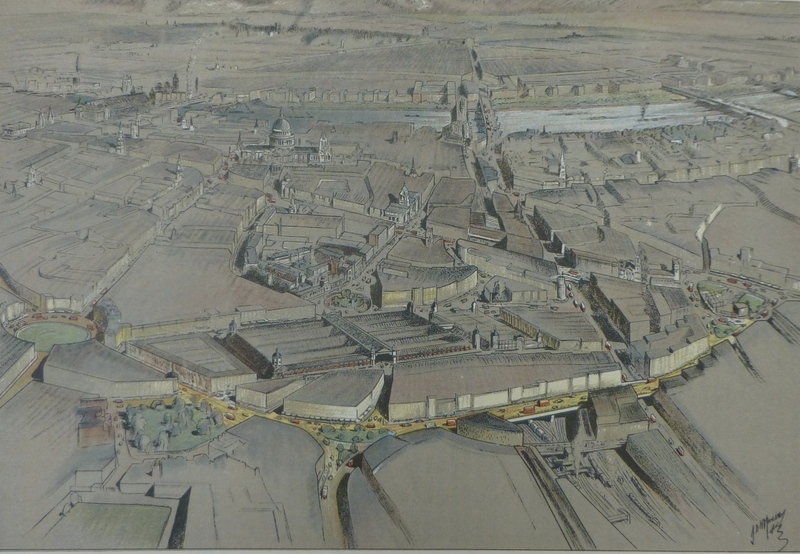 It was not just the boundary routes where major changes were proposed to accommodate traffic, the central City also had some horrendous schemes. 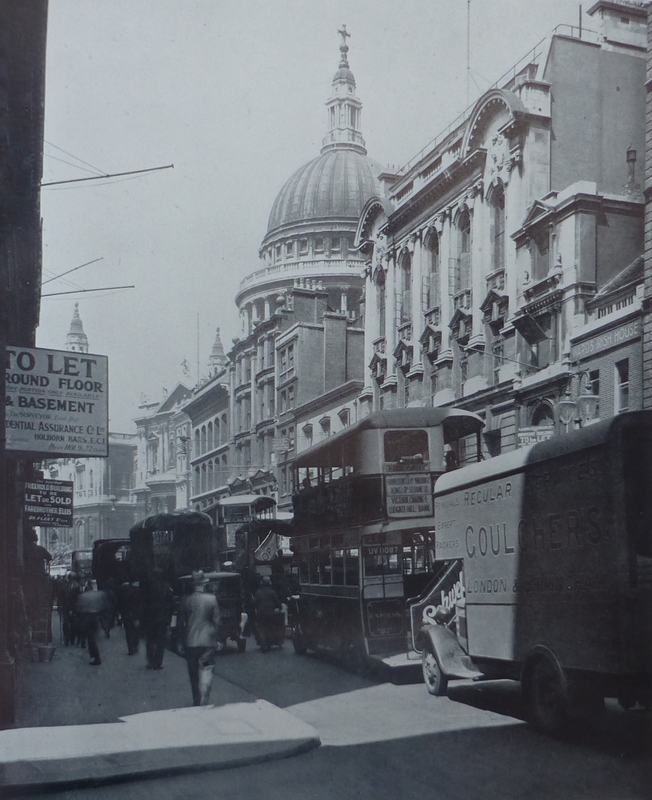 Yes, that is the church of St. Mary-le-Bow to the right, with Cheapside dug out to form a lower level for traffic. Thankfully it was postponed on grounds of cost and never resurrected. If the proposals had been fully implemented, there would have been considerable infrastructure across the City to support the car. The following map shows proposed Car Parks and Garages. Solid black shows where multi-level car parks were proposed. The run of car parks at top left were those shown in the drawing of the northern boundary route above. Note also that multi-level car parks would have run along Upper and Lower Thames Street. The tick vertical lines represent underground car parking. Horizontal lines represent additional possible car parking whilst the limited number of cross hatch markings represent possible lorry parks. The star symbols represent locations for commercial multi-storey garages. 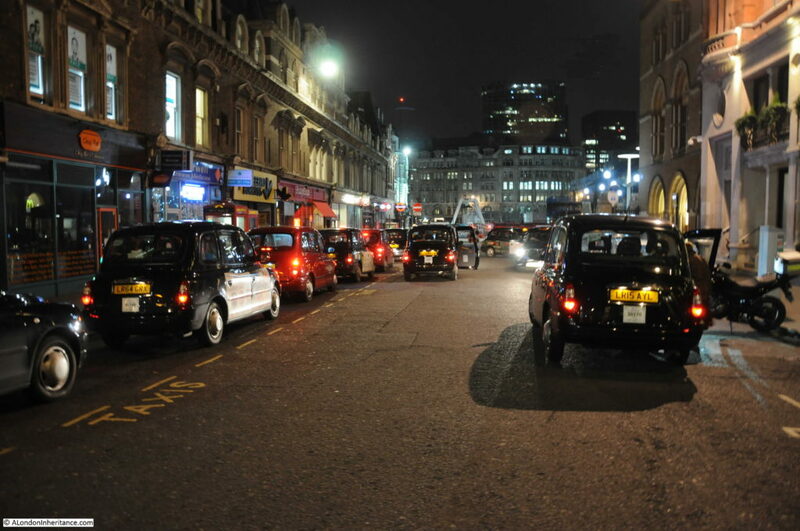 There would not have been a problem parking in the City of London if all this lot had been built. Although there was considerable emphasis on the car and other forms of motor traffic, public transport was also a consideration. The following diagram shows Bus Traffic in 1947. The table that accompanies the above diagram is shown below. This details the traffic density during the peak hour for the bus routes through the City and includes bus service number, frequency, density of buses per peak hour, and density in either direction. As a reminder that buses were not the only form of ground level public transport at the time, similar data is also provided for trolleybus and trams. Given the time, I would love to create similar tables for bus traffic today as a comparison. The title of the book includes the sub-title “A Record Of Destruction And Survival”. 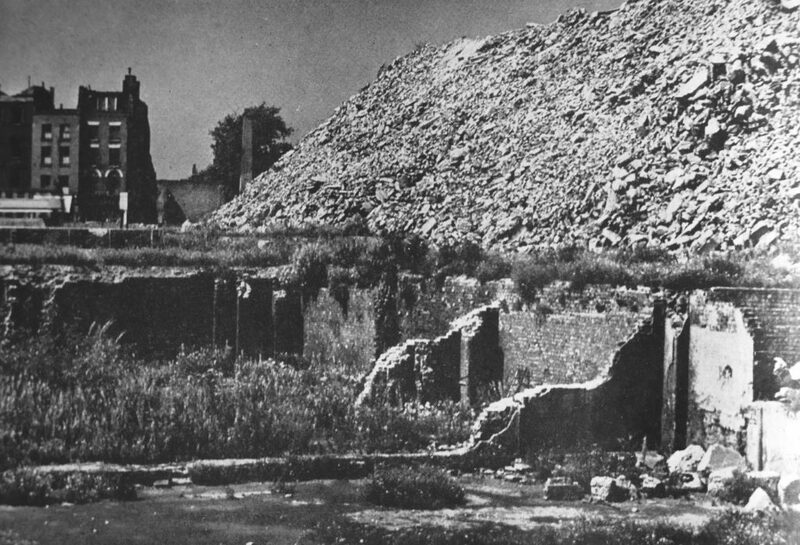 The book has a large section documenting the destruction of parts of the City during the war. This part of the book includes a large number of photos. It was fascinating to find that a number of these photos were of similar scenes to the photos taken by my father. The following is my father’s photo of the tower of All Hallows Staining taken from Mark Lane. 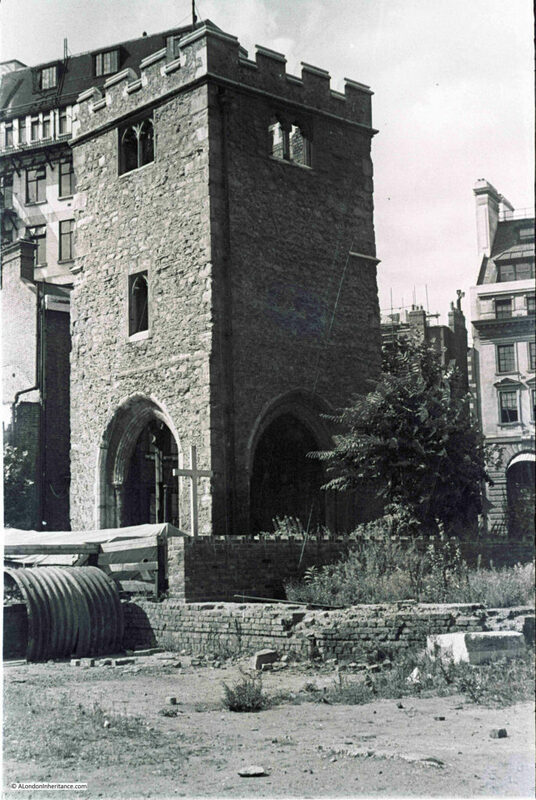 This photo from the book also shows the tower of All Hallows Staining, but from the opposite side, looking back towards Fenchurch Street Station, the facade of which can be seen in the rear of the photo. 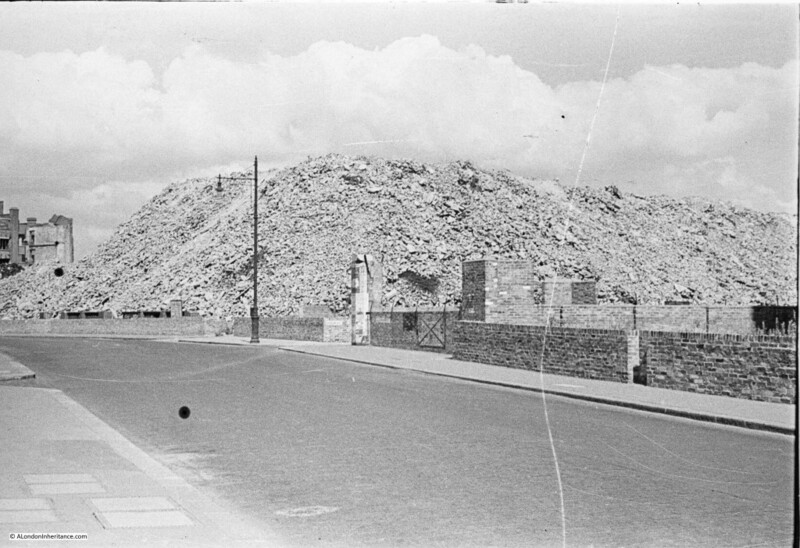 Another of my father’s photos showed a very large pile of rubble following the demolition of bombed buildings in Aldersgate. 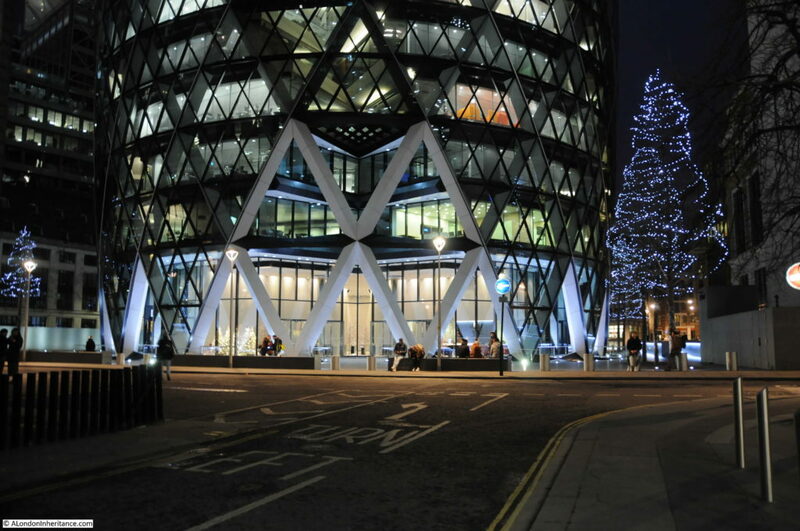 The City of London – a record of Destruction and Survival is a fascinating book. 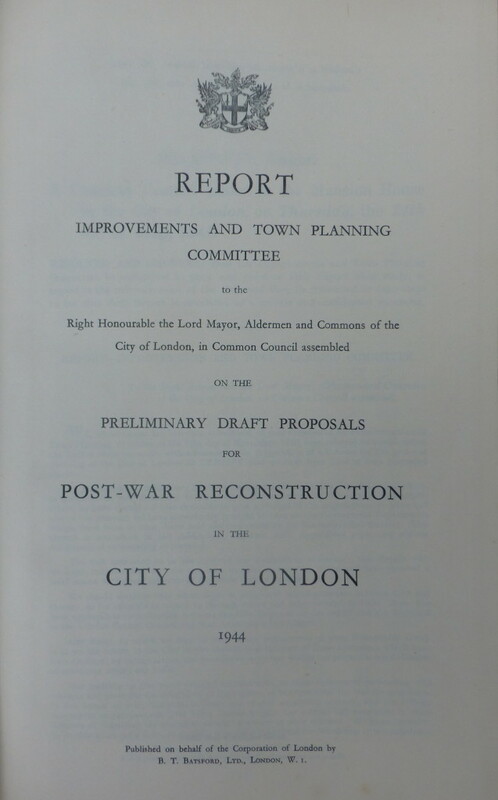 Although primarily a means of publishing the 1947 proposals, in its 340 pages the book contains a wealth of information on the history of the City, the damage to the City during the war, the workings of the City, the start of redevelopment of the City and what the City could look like should the proposals be fully implemented. The text and photos are supported with lots of data and statistics. And for me, a book with fold out maps is always a thing of beauty. 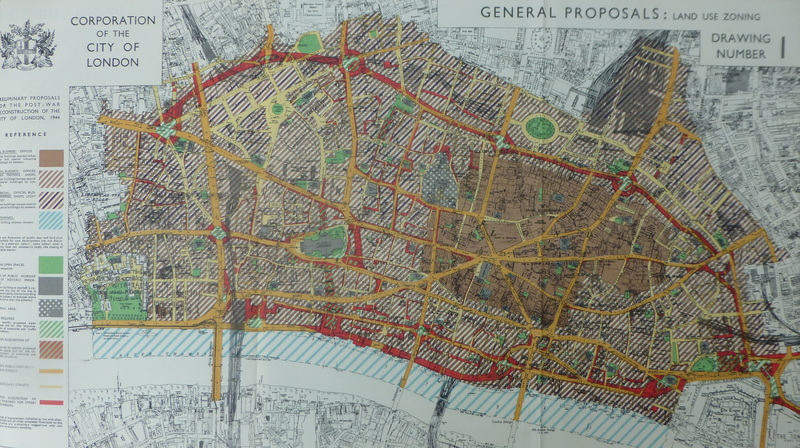 The immediate post war period created many proposals that if fully implemented would have transformed the City of London. Thankfully the multi-level traffic routes did not get built, Cheapside did not get an underpass and the north and south of the City are not bounded by multi-storey car parks. The ideas about creating space for pedestrians are good, as are the proposals for opening up the views of the river and walkways along the river. Many of these ideas have been implemented, but perhaps not as dramatically as proposed in 1951. The separation of pedestrians and traffic can still be seen in the remaining lengths of the pedestrian ways (pedways). When reading these books, I always wonder what the authors of these proposals would think of the City if they could take a look today, 70 years later. Would they be pleased with the result, would they wonder about the lost opportunities, and perhaps be thankful that some of their proposals were not implemented. Planning the development of a City for the long term is very difficult, there is no way of knowing what external or internal changes may suddenly move the City in a new direction. It is intriguing to wonder what the City of London will look like in another 70 years. 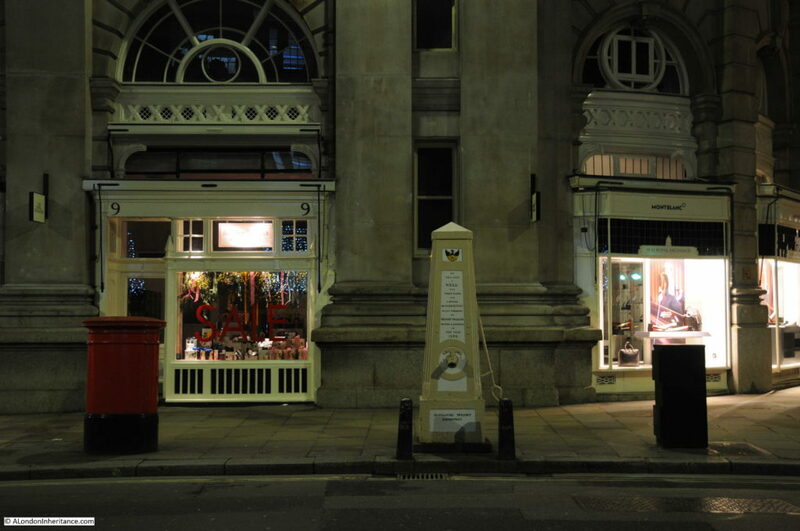 This entry was posted in London Books and tagged City of London on January 13, 2019 by admin. 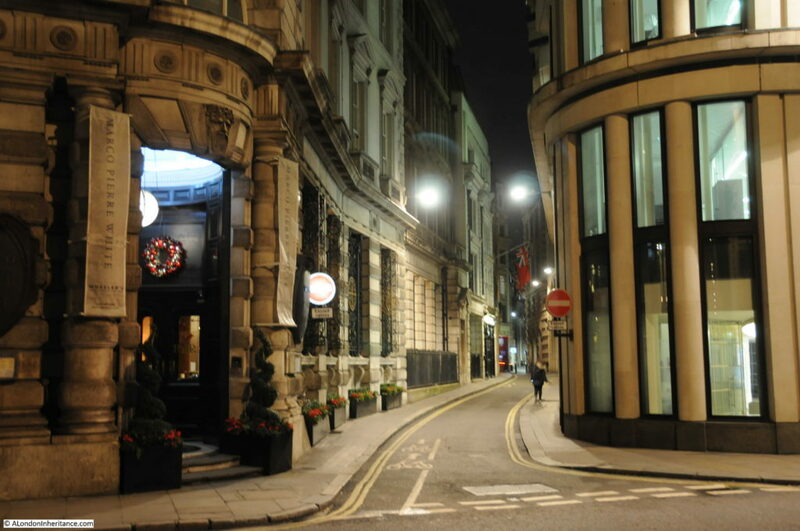 The area between Cornhill and Lombard Street has largely avoided much of the Victorian street widening and development, and more recent post war construction. Within this area can still be found alleys and courtyards that have retained their street plan for many centuries. 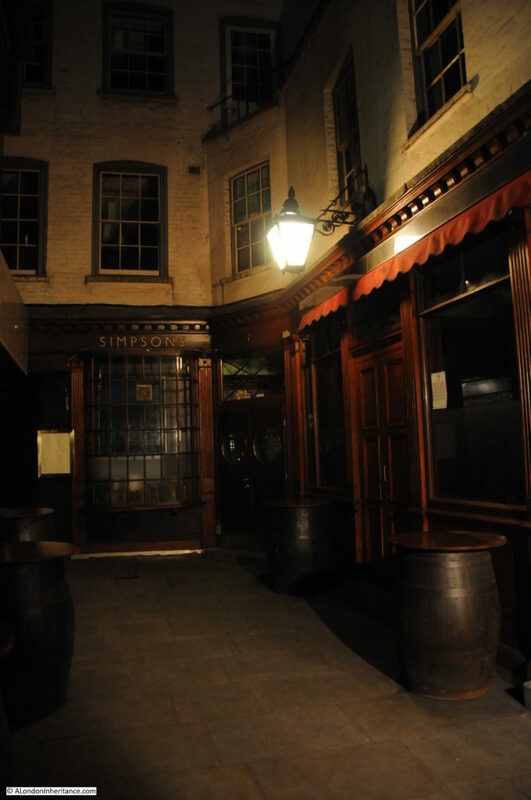 One such place is Ball Court, the home of this week’s location, Simpson’s Tavern – the oldest chophouse in London. My father took his photo during the day, however the shade of the surrounding buildings gives the impression of this being a twilight photo. There have been cosmetic changes to the front of the building, however the building that houses Simpson’s Tavern is basically the same. 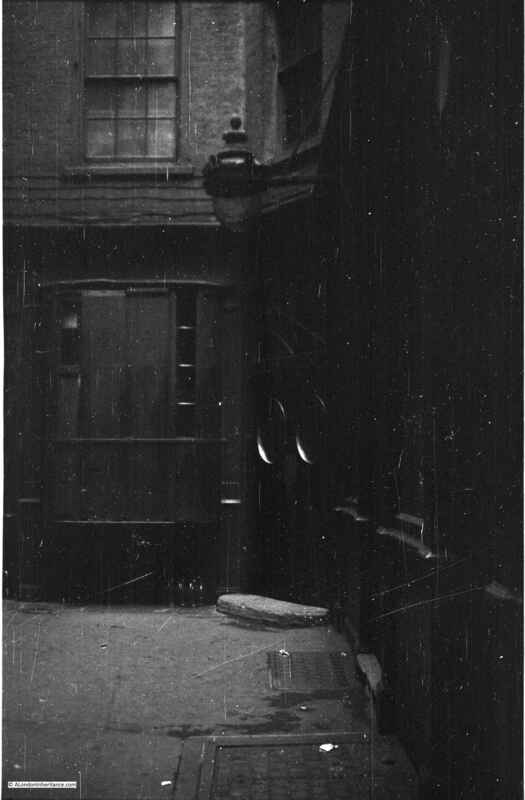 In 1947 it looks as if wooden planks had been put in front of the window on the left of the door. 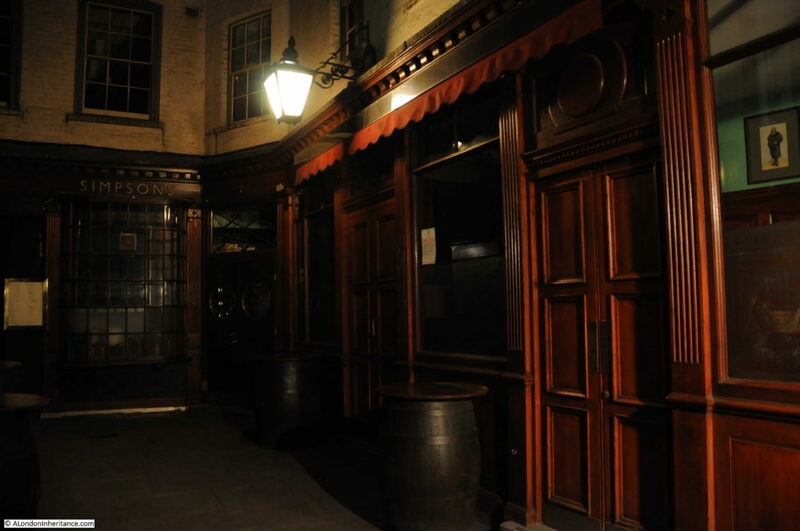 The main entrance still has two circular windows on each door and there is a single light above the tavern. 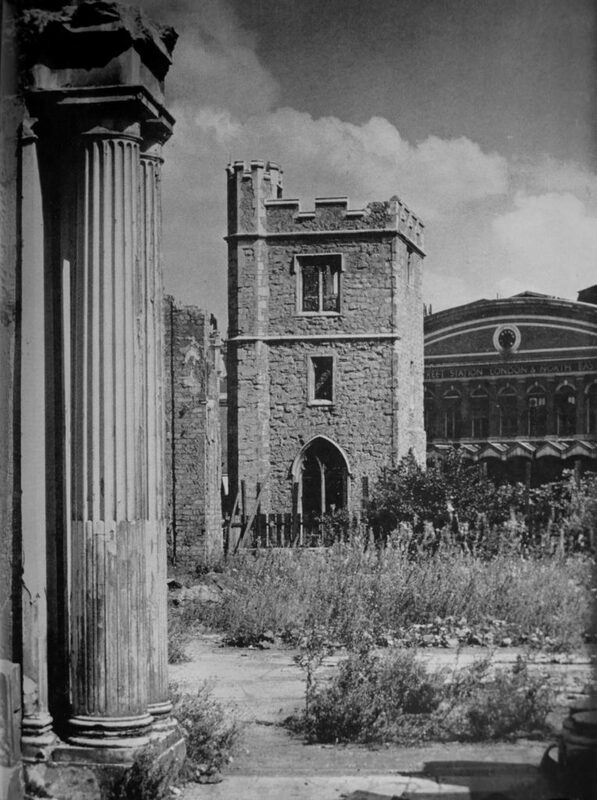 I suspect the circular windows may have been relatively recent in 1947, however the 1947 view probably also looked much the same in the previous century. 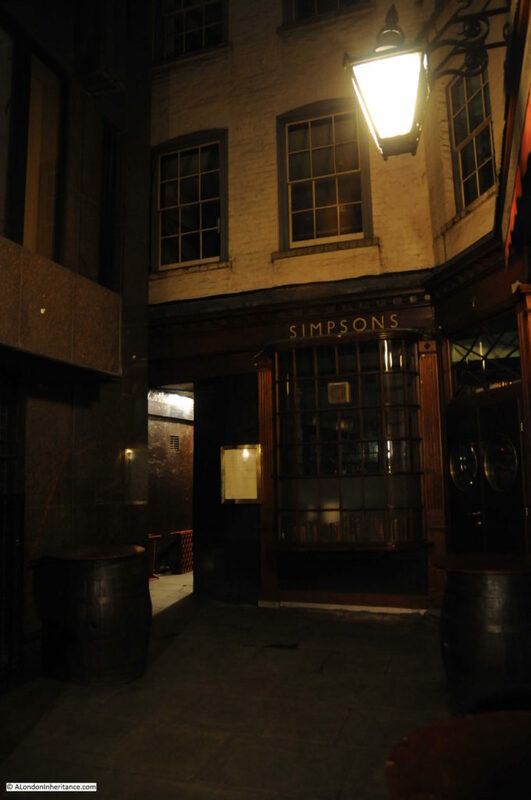 Simpson’s Tavern in the Ball Court location opened in 1757 by Thomas Simpson following an earlier restaurant opened in 1723 in Bell Alley, Billingsgate and then the Queen’s Arms, Bird in Hand Court, Cheapside. Simpson’s Tavern is a busy daytime restaurant and bar serving traditional food – the breakfasts are rather good after an early start. 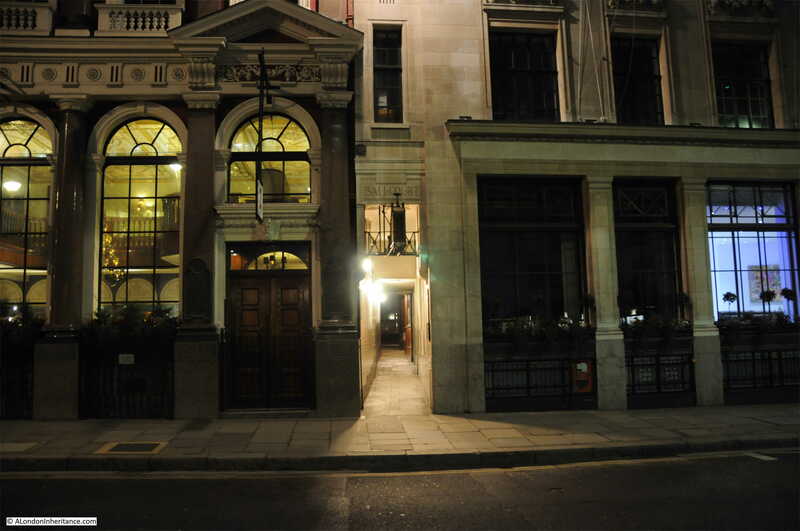 The building is Grade II listed, and the listing states that the buildings are of late 17th or early 18th century construction. 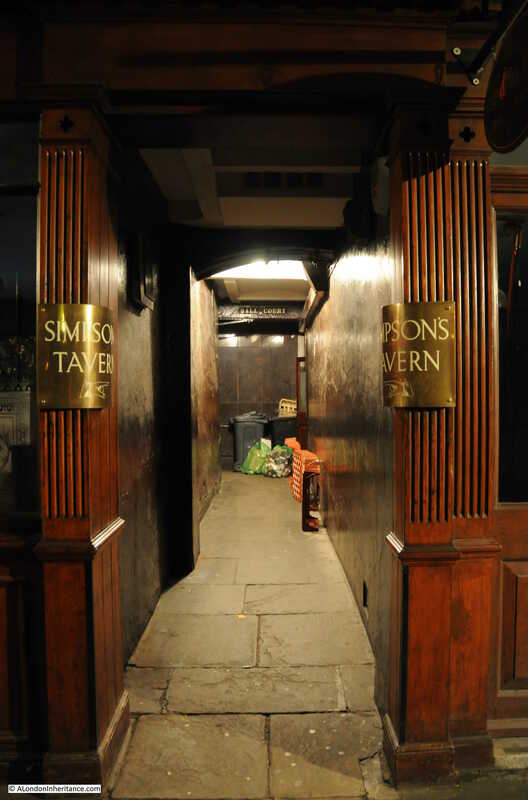 The entrance to the alley that leads down to Simpson’s Tavern is shown in the photo below. A narrow, covered alley leading off from Cornhill. Ball Court is not often named on maps. 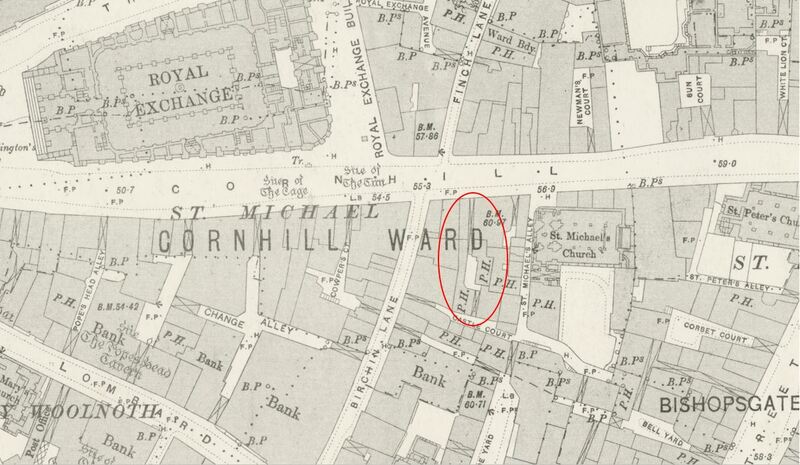 I have ringed Ball Court in the following extract from the 1895 Ordnance Survey map. 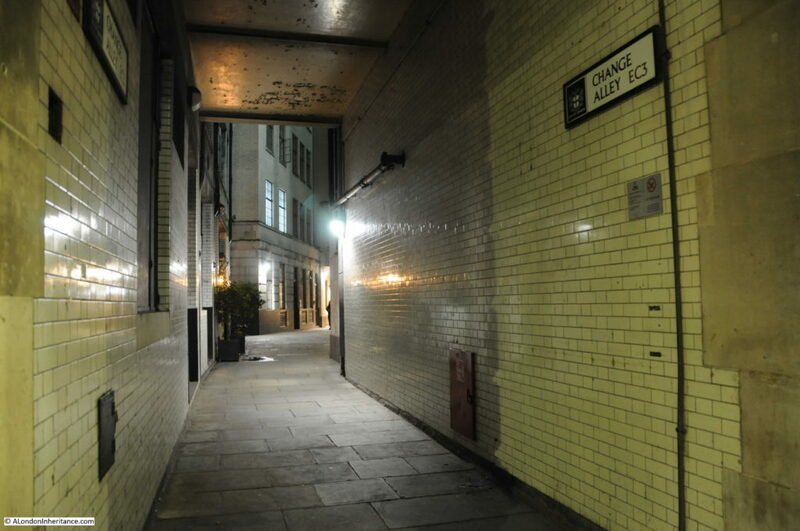 The large X in the grey area where the alley leads off from Cornhill indicates that there is a building above the alley. The small court is shown with the P.H. letters for two pubs on either side, the one on the left being Simpsons Tavern. 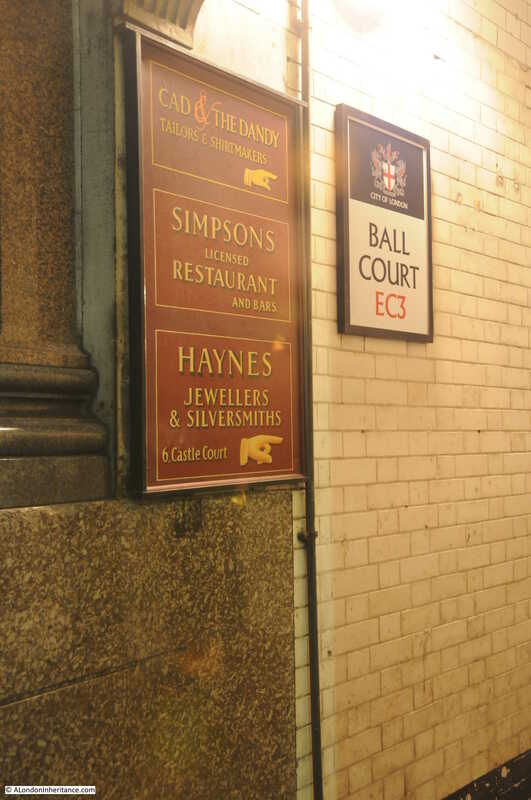 There is a further building over the alley leading out from the court in the opposite corner.The map also illustrates the number of little alleys and courts in this part of the City. 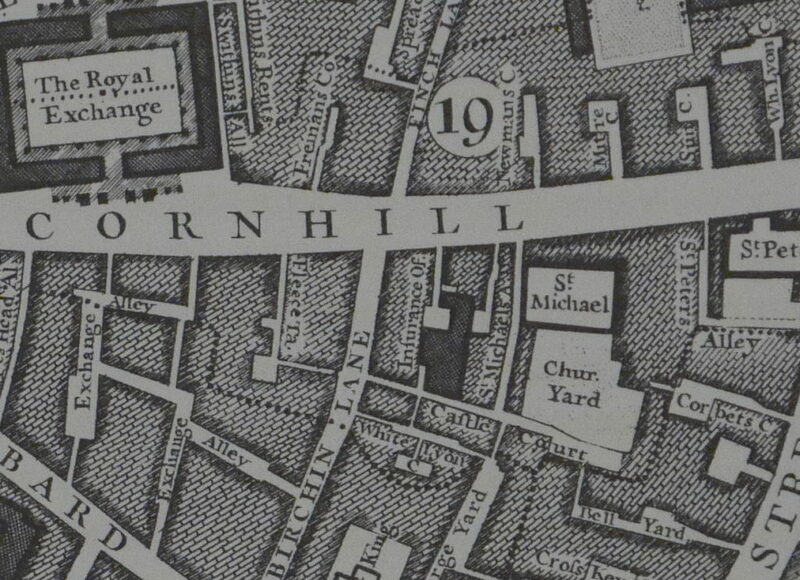 The alley and court can also be seen in John Rocque’s map of 1746 (just below the first L of Cornhill), however in 1746 the court looks to have been a slightly different shape. This was eleven years before Simpson’s Tavern would open. I stood in Ball Court for 15 minutes and did not see another person. It was quiet and it felt almost like being in one of the recreated streets you can often find in museums. To walk along Ball Court and visit Simpson’s Tavern is to walk through a much older City when narrow alleys, courts in almost perpetual shade and hidden taverns could be found in between the main streets, It is also good to find a place in the centre of the City almost unchanged since my father took his photo in 1947. 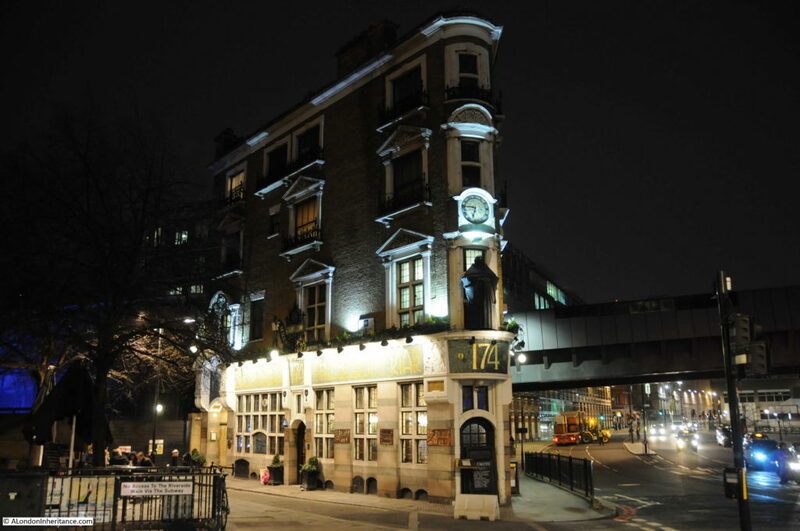 This entry was posted in London Pubs and tagged Ball Court, City of London, Simpson's Tavern on February 4, 2018 by admin. 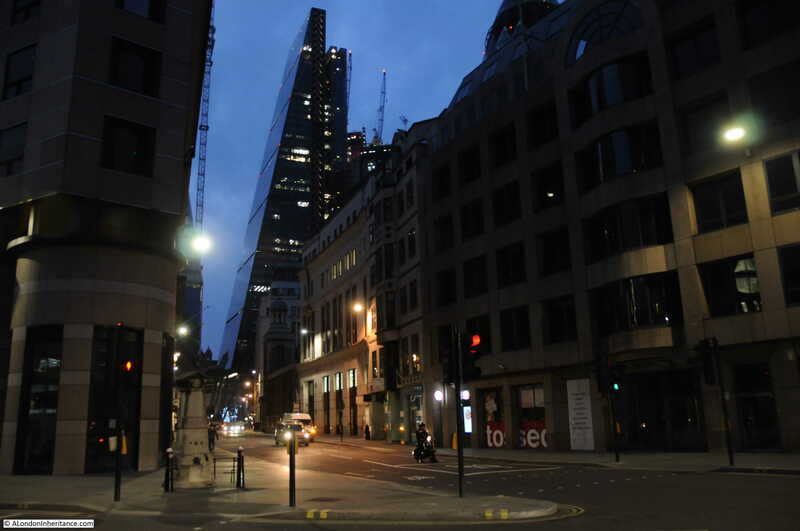 For fifty one weeks of the year, the City of London is busy. 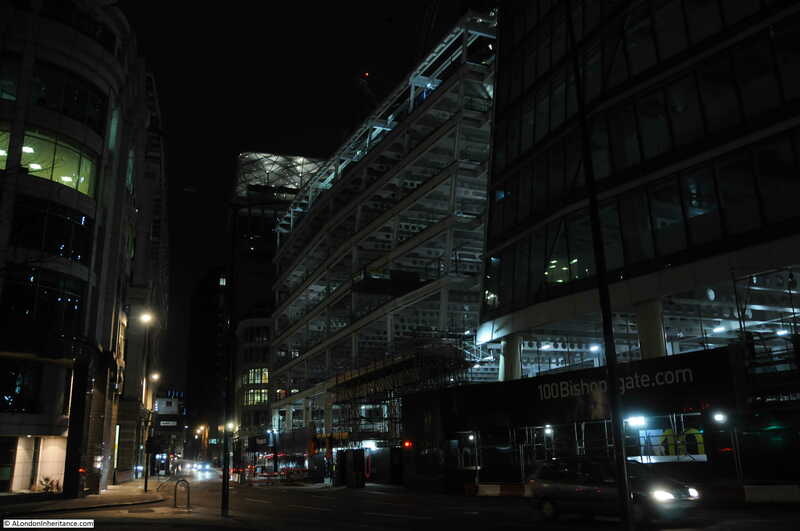 During the working week, the City is full of office workers, the pubs and restaurants are busy in the day and evening, and building sites are covered by workers in hi-vis jackets. During the weekend the City still does not sleep. Roads will be closed for roadworks, or to allow cranes to block the road as they lift equipment into construction sites. Hi-vis jackets continue to be a common site across the weekend as building work does not stop. There is one week in the year when all this stops. 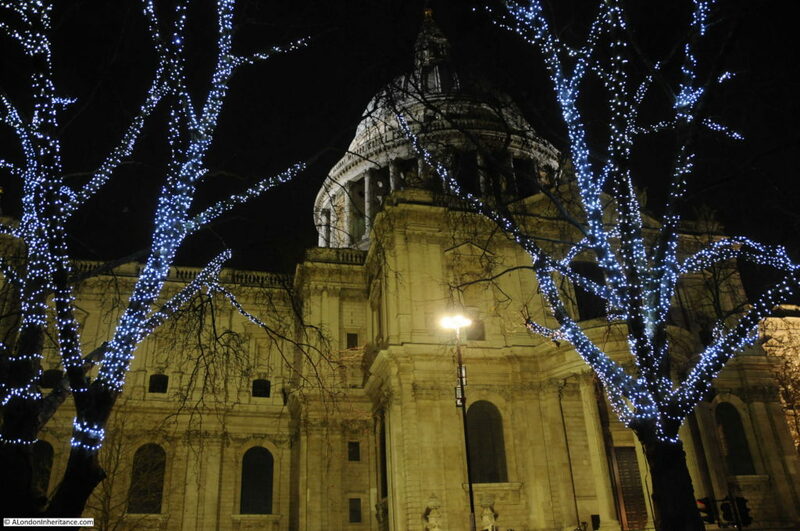 Between Christmas and the New Year the City turns into a rather magical place. The number of office workers is considerably reduced and almost all the construction sites are closed for the week. The City takes on a very different appearance, much quieter, less traffic, the cranes are still and there are very few walkers along the City streets. At the end of 2017, between Christmas and New Year I took a walk through the City. I waited until late afternoon as the City looked better after dark than on a grey December day. I took the underground to Tower Hill and then followed a random route to Blackfriars. Along this route I found streets where on a late afternoon / early evening I could stand for twenty minutes and not see another person (this could also have been longer but after twenty minutes I was getting bored and cold). There is a common scene in the entrance foyers to many of the office buildings. 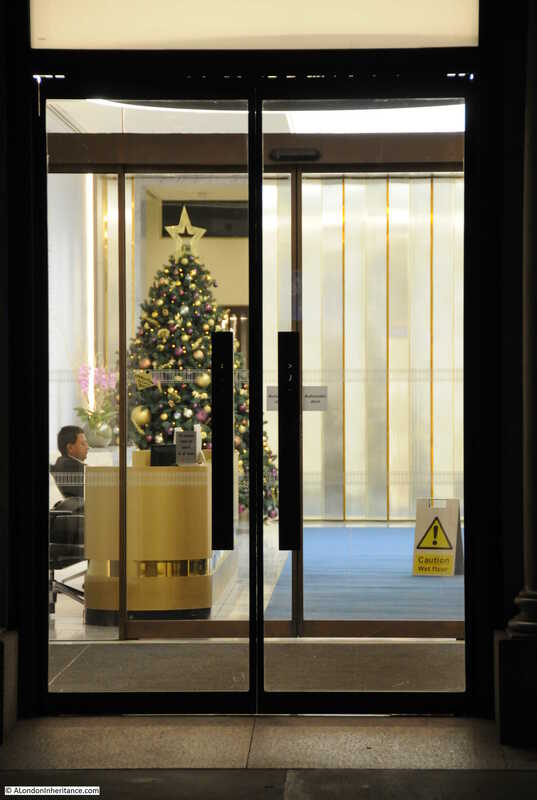 A solitary security guard sits behind the reception desk and decorated Christmas Trees celebrate the season, but with very few people around to admire them – they will probably have been removed by the time the City returns to life after New Year’s Day. 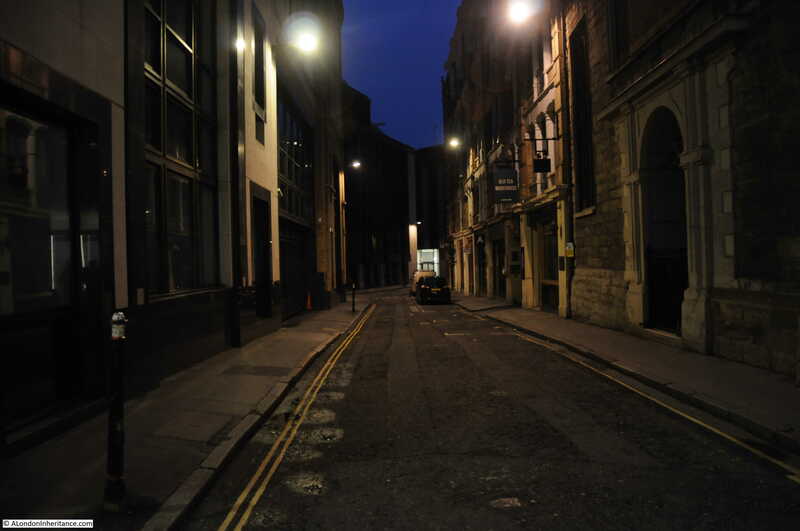 Just off Leadenhall Street is Creechurch Lane. The church of St. Katherine Cree is on the corner, and part of the church is on the right of the photo below looking down Creechurch Lane. 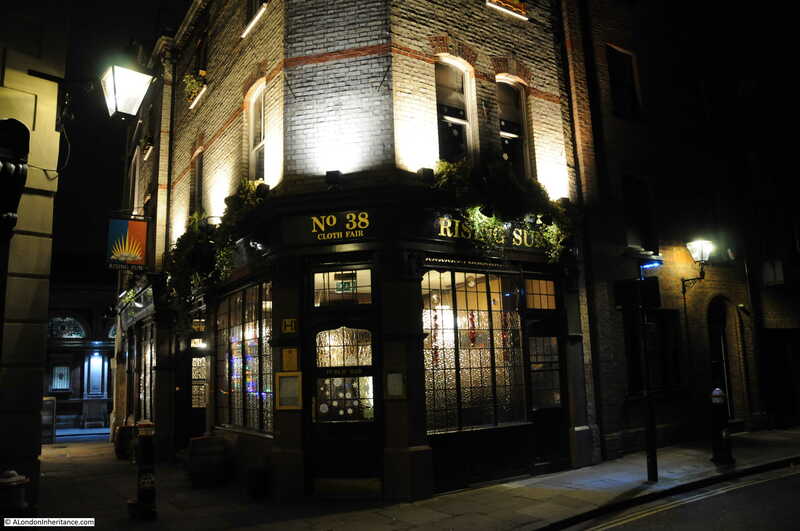 Despite the City’s 2,000 year history, the noise, traffic, construction work and numbers of people often make it hard to reconcile the City streets with that long period of time, however at this time of year, and along such a street, it is possible to feel the history of the City. 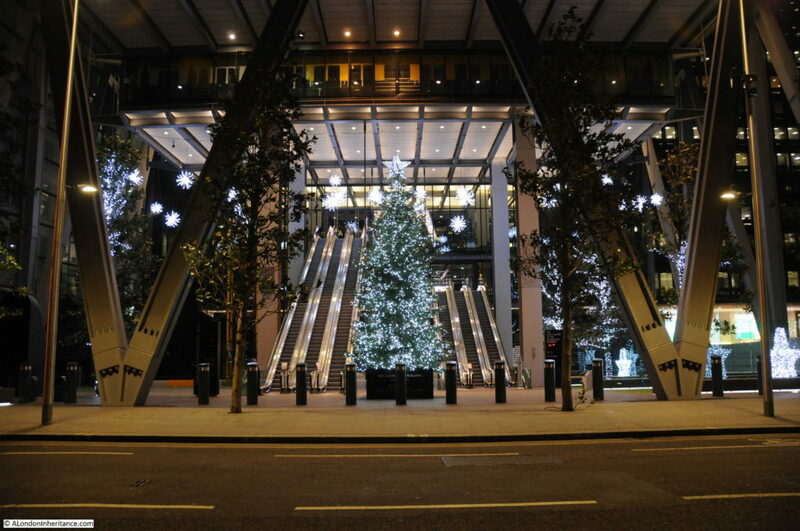 At the base of the Leadenhall Building. All the escalators were running, but at this time of year there were no passengers for them to take up into the building. 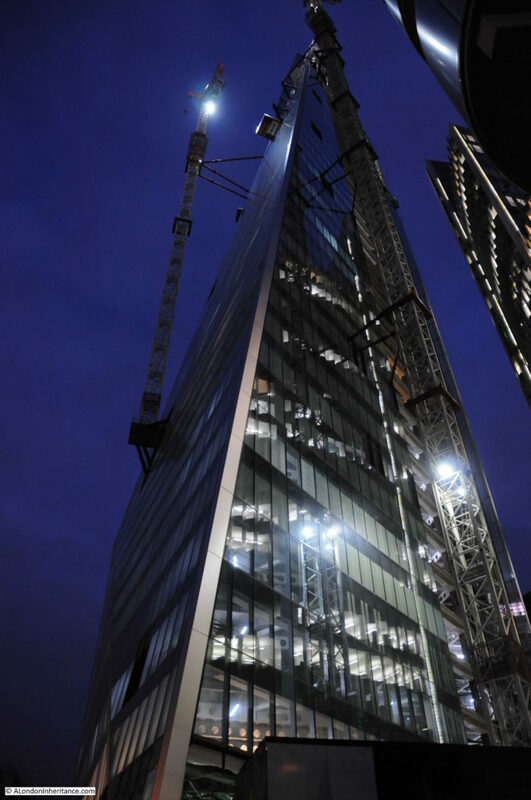 Among the increasing number of glass and steel towers, there are still historic buildings to be found. 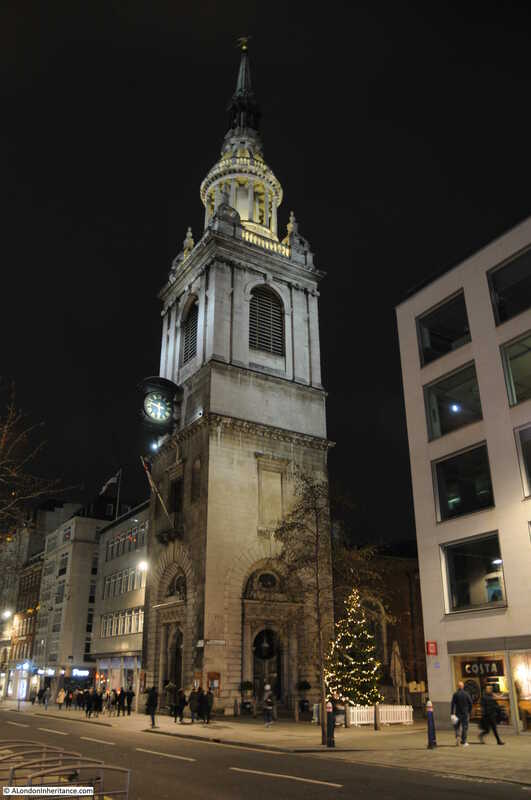 This is the church of St. Helen’s, Bishopsgate. And here it is possible to appreciate the multi-dimensional nature of the City. 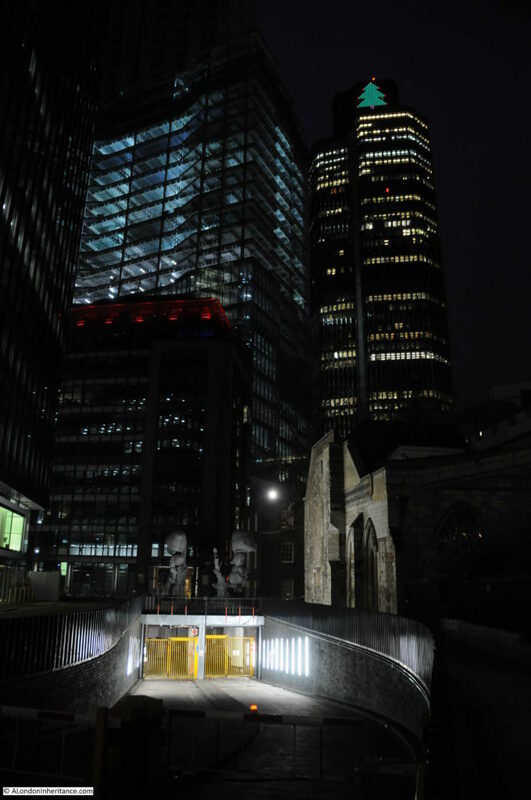 An entrance to a recently built underground car park is next to a church which was originally established here in the 13th century, whilst the City’s original tall tower, the NatWest Tower, now Tower 42 stands in the background with the frame of a new building to the left. 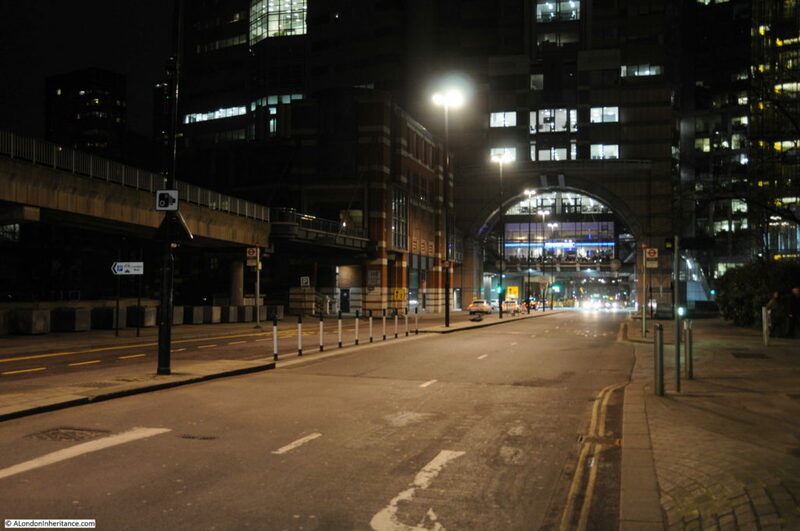 Leaving Camomile Street I turned into Bishopsgate. 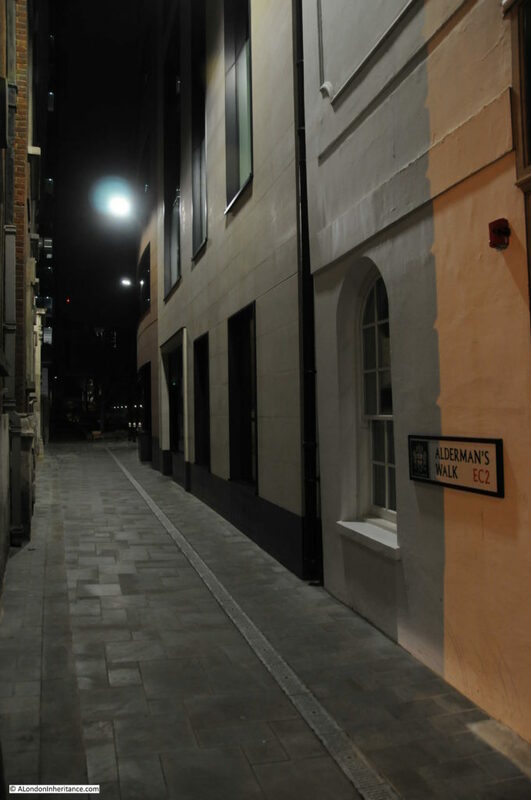 One of the narrow streets leading off from Bishopsgate is Alderman’s Walk, silent on a December evening with no footsteps echoing off the walls. 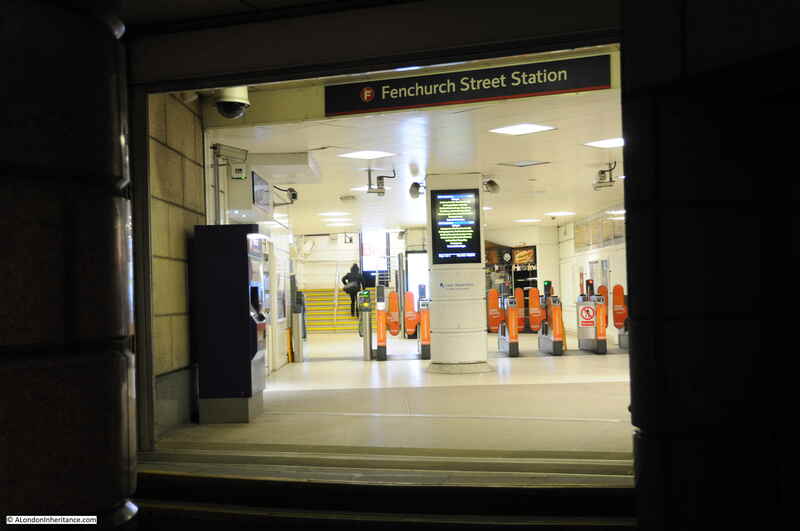 The concourse of the station was the quietest I have seen for many years. 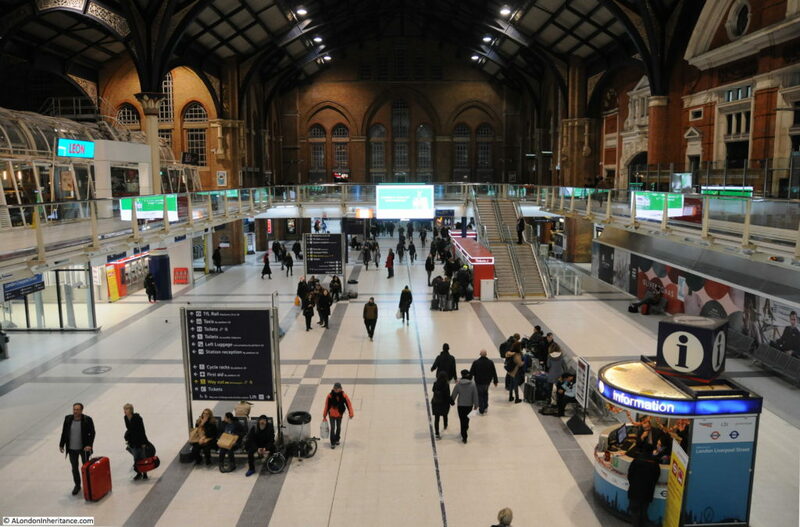 A reduced service during the Christmas / New Year period was serving a reduced number of passengers. 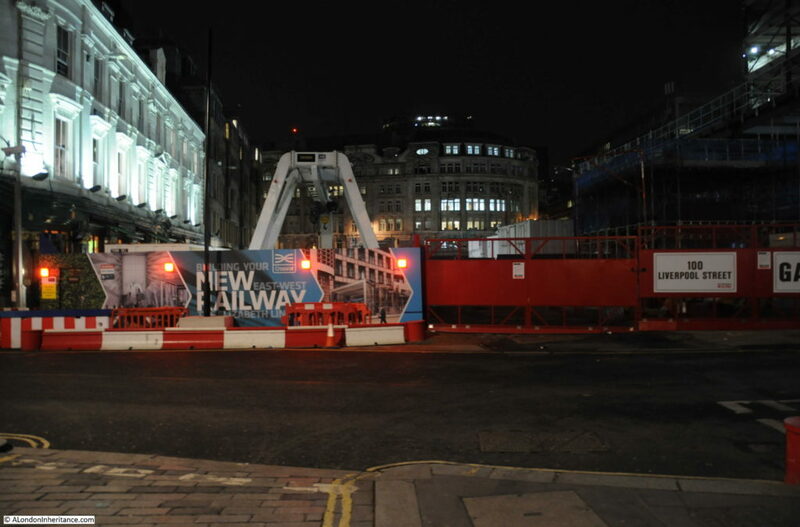 Outside Liverpool Street Station, the construction site for the Elizabeth Line / Crossrail was closed, also part of the construction break between Christmas and the New Year. One of the entrances to Liverpool Street underground station on the right and Liverpool Street station in the background. 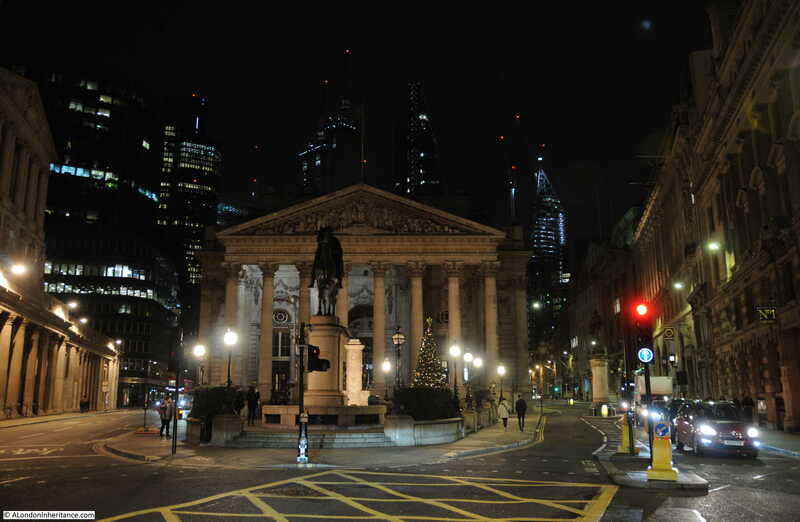 At the Bank junction of Threadneedle Street and Cornhill looking back at the Royal Exchange. The towers of the City form a menacing backdrop to the low-rise buildings around this usually busy junction. 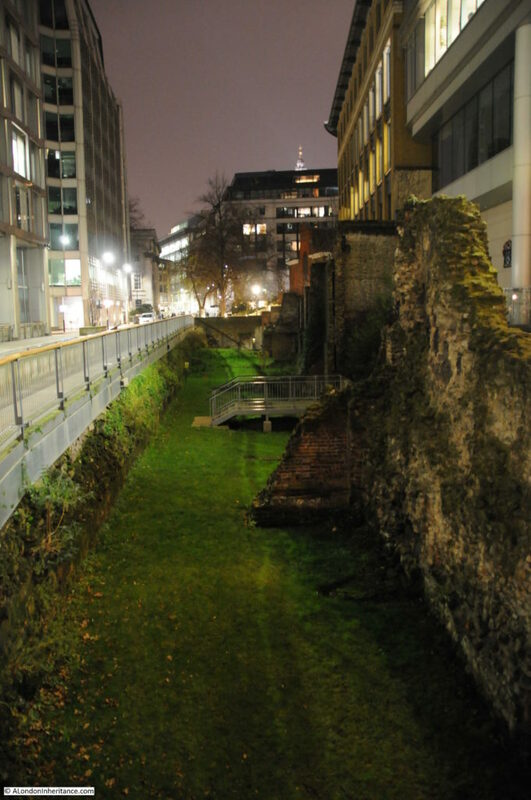 At the top of Noble Street is London Wall. It was easy to take a casual wander across the road, unlike most days when there is usually plenty of traffic. 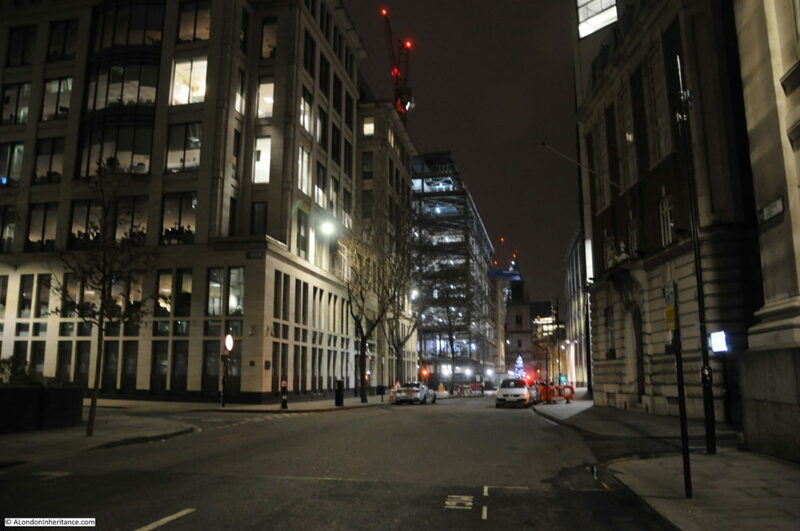 From London Wall, I walked up Aldersgate Street, then turned into Long Lane to head towards Smithfield. This is East Passage that runs parallel to Long Lane and Middle Street, between the backs of the buildings that face onto these two streets. Another place where I stood for some time without seeing another person. 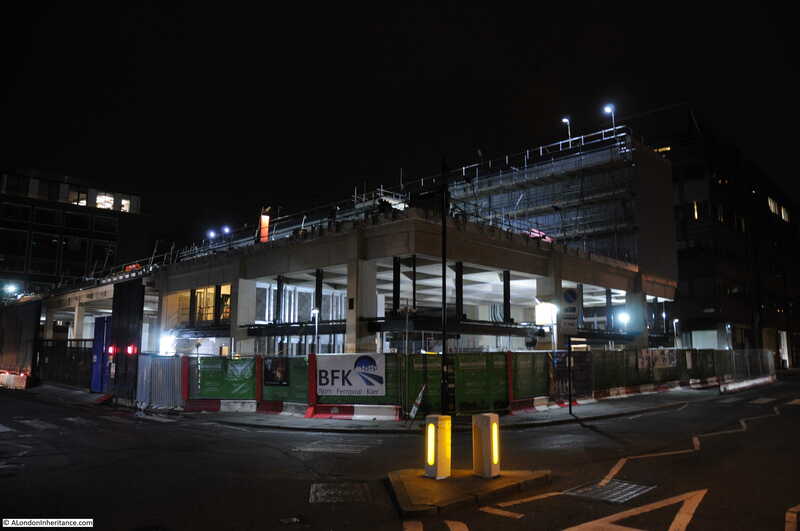 The Crossrail / Elizabeth Line ticket hall for Farringdon Station. This is planned to open in a year’s time in December 2018 and will probably be the catalyst for significant development in the area. For now, all is quiet. 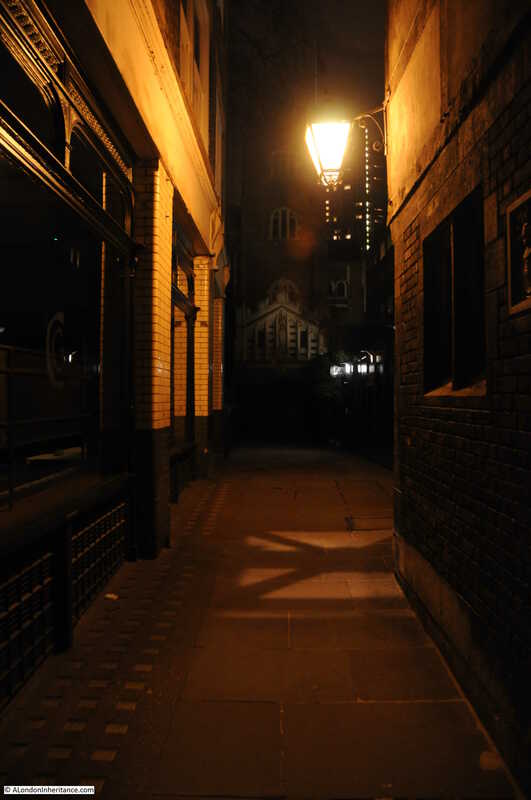 From West Smithfield I walked under the gatehouse into the alley leading to the church of St. Bartholomew the Great. Again one of the places where the past feels almost tangible (despite one of the towers of the Barbican in the background). 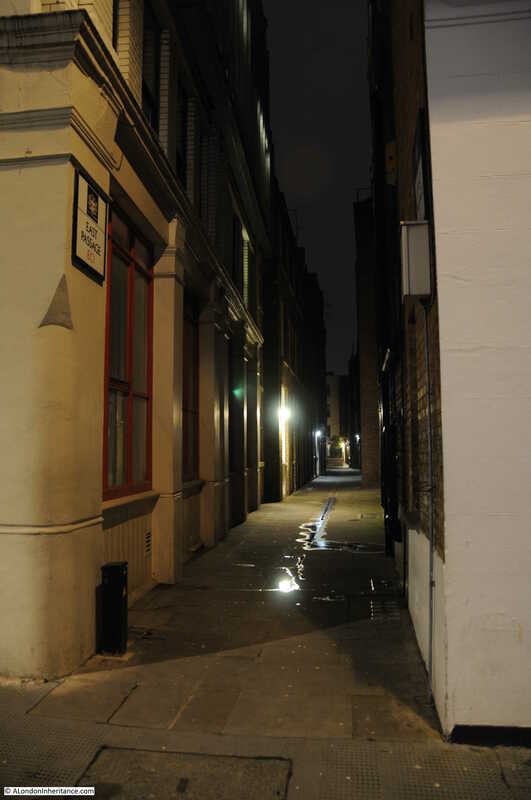 Whilst I was here, one person did walk across the graveyard and then along the alley – the noise of their footsteps, echoing of the buildings was surprisingly loud and emphasised the lack of other sounds in the alley. From West Smithfield, I walked along Giltspur Street, turning left into Newgate Street then down into Paternoster Square. 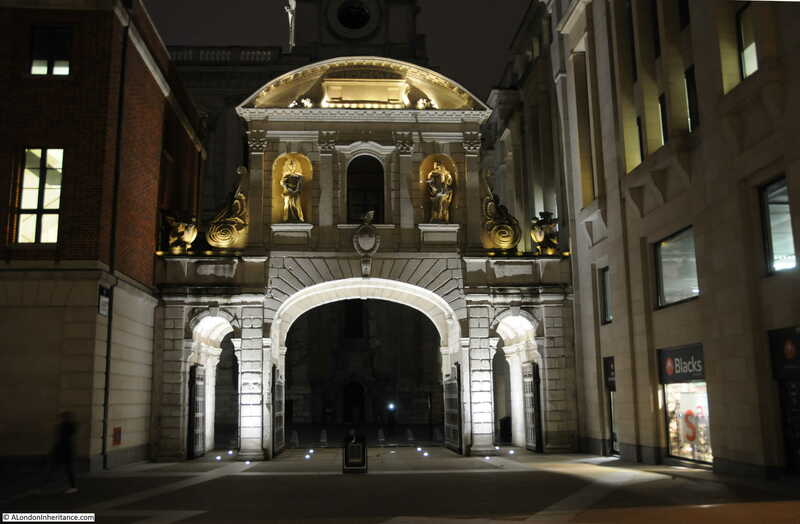 The Temple Bar gateway looks very good after dark. 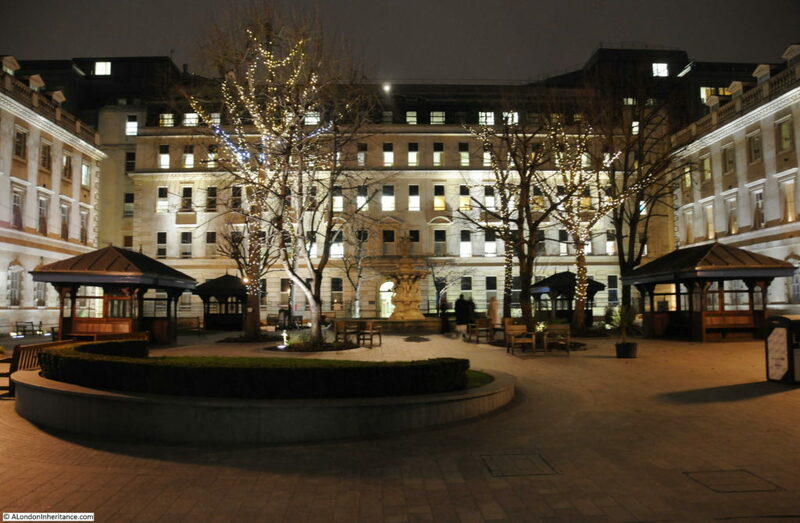 From St. Paul’s it was then down to Queen Victoria Street to my destination of Blackfriars underground station, although before reaching the station I had a much needed stop off at the Blackfriar. Photographing London over the Christmas to New Year period can be a bit of a cliché, however I really do find that walking the City at this time of year, without the noise, construction work, traffic and crowds does help to bring the history of the City to life – so many of the normal distractions have been removed. Standing in places such as Creechurch Lane, East Passage and the entrance alley to St. Bartholomew the Great feel like standing in places unchanged for hundreds of years. 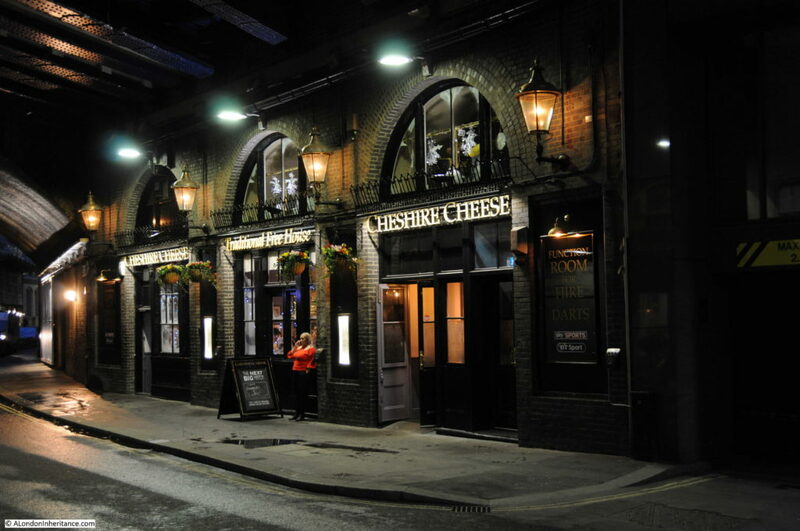 The City pubs are also much quieter in the evenings at this time of year and there is nothing better than walking into a warm, inviting pub from a cold street – which is exactly where I finished. 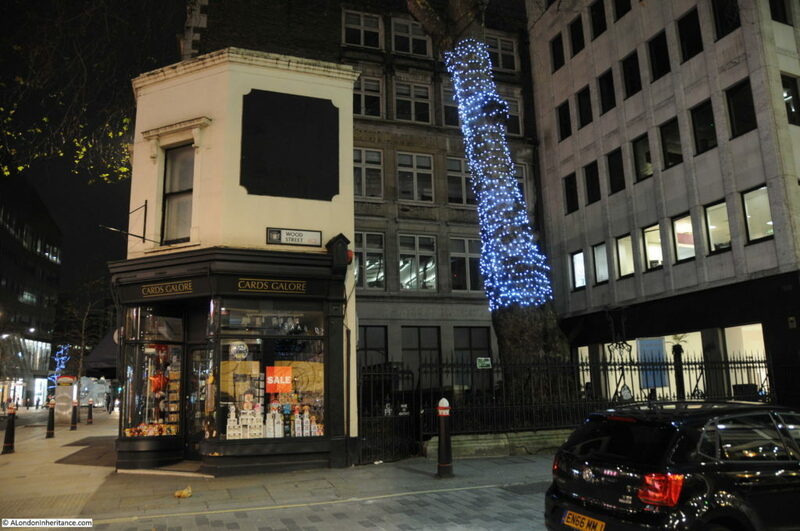 This entry was posted in London Photography and tagged Christmas, Christmas Lights, City of London on January 7, 2018 by admin. 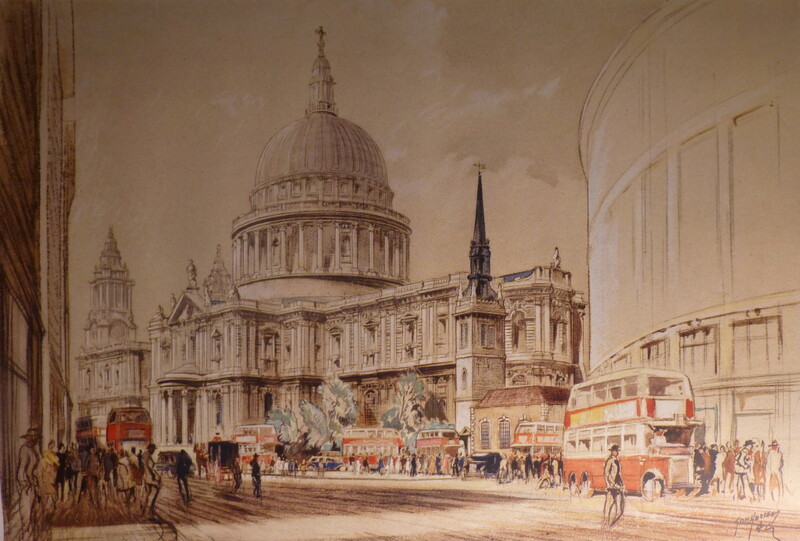 During 1941, even as London was still under attack and the V1 and V2 weapons were still some years in the future, plans were being devised for reconstruction in the City of London. Resolved and Ordered, that the Improvements and Town Planning Committee be authorized to print and circulate their report when ready, in regard to the redevelopment of the City, and they be instructed to take steps to see that their Report is circulated as a private and confidential document”. The report was published almost 3 years later on the 24th of May 1944 and makes fascinating reading. The report provides an insight into the pre-war City and documents proposals for how the City should be redeveloped after the war. Many of these proposals we can see implemented across the City today. The report also contains a wonderful set of artists impressions of the proposed developments along with a large set of fold out colored maps showing different perspectives of the City. There are many maps in this post. To see the map in full detail, click on the map and a larger version should open up. Much of London was rebuilt after the Great Fire using the same street layout as before the fire. There were a number of developments in the following centuries with the 19th century seeing many of the larger, city wide developments being completed. 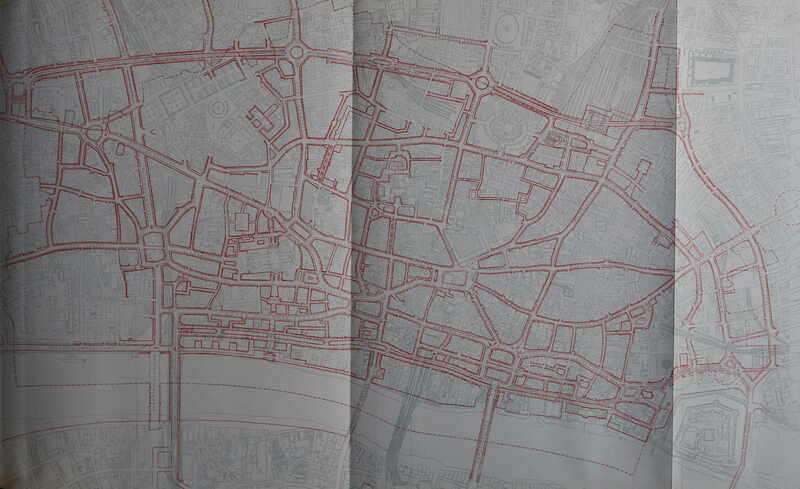 The first map in the report highlights the street improvements made in the City of London during the 19th century. 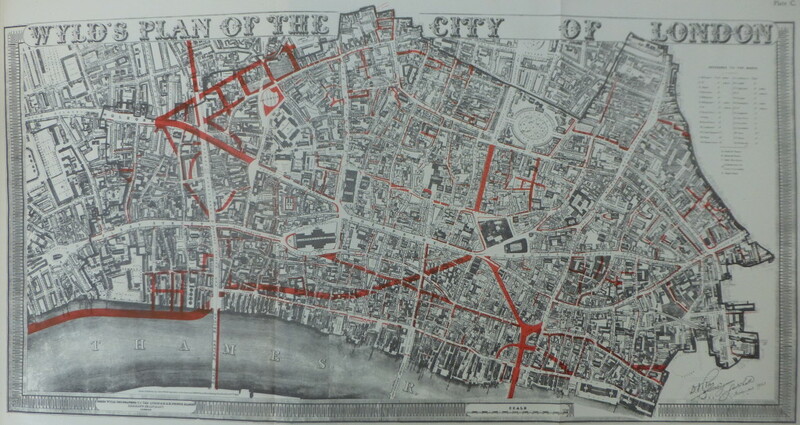 The report states that “This plan was submitted with the evidence of the Corporation of London before the Royal Commission on London Traffic, 1905 when it was stated that the street improvements carried out between 1851 and 1902 and financed out of Rates involved an expenditure of over £5,600,000 gross and £3,800,000 net, of which almost £3,000,000 was paid out of the City’s Consolidated Rate, the remainder being met mainly by contributions from the Metropolitan Board of Works (later the London County Council). 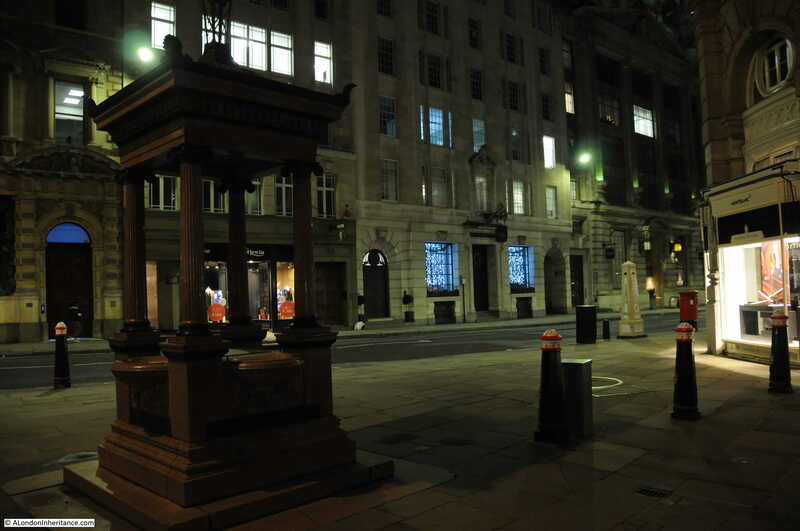 Other similar works in the City during the same period involved an outlay of over £3,000,000 including Holborn Viaduct, Blackfriars and Tower Bridges. The map clearly shows how Queen Victoria Street cut through so many streets and buildings leading from the Bank down to the new Embankment which runs along the river’s edge at lower left. 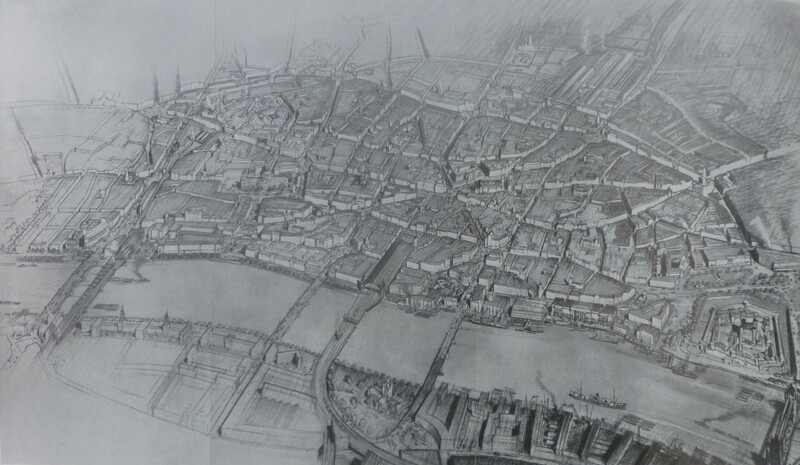 The first of the artist impressions from the report shows the preliminary proposals for the reconstruction of the City of London and is titled “Bird’s-Eye General View From The South”. The detail on the map is fascinating. The City churches are shown with their steeples raised above the surrounding buildings. The next artist impression shows a view from the north-west with the proposed northern arm of the ring route between Holborn Circus and Aldersgate Street. 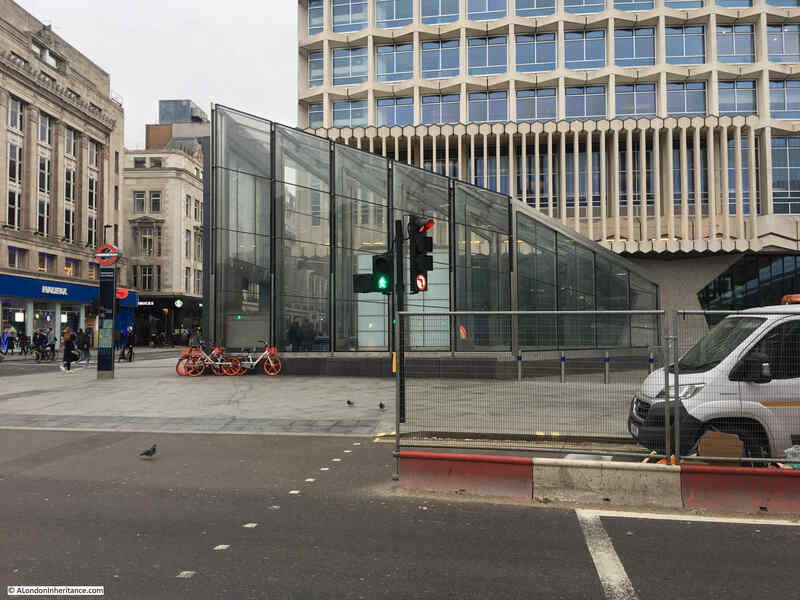 This did not get built, if it had, the large roundabout shown to the left would occupy the space outside the Barbican Underground Station and the roundabout would have cut Aldersgate Street in two. The table shows that whilst the population of Greater London was increasing, the residential population of the City of London was decreasing with only 10,000 residents by 1935. 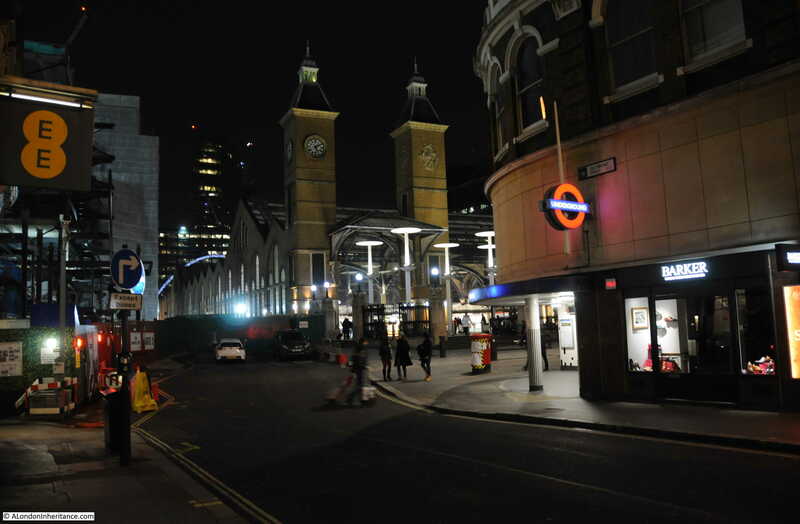 As today, the population of the City is significantly different during the day due to the vast number of workers who travel in from the rest of Greater London and beyond. 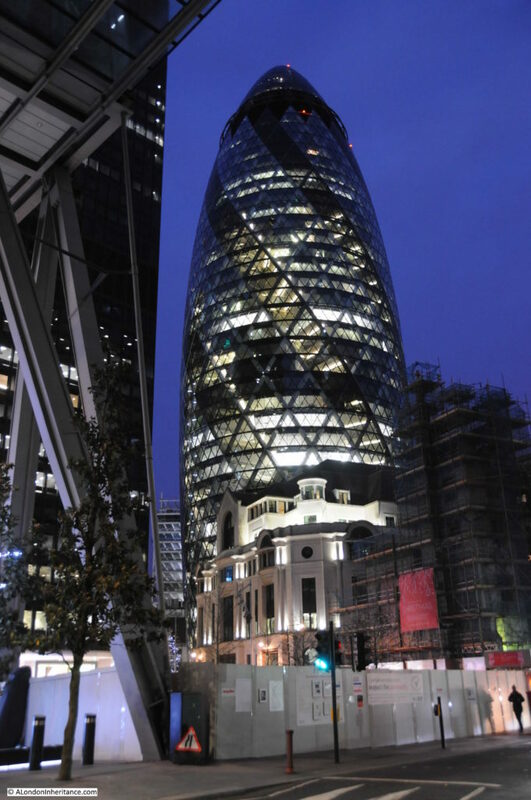 For comparison, the 2011 census reported 7,400 residents in the City of London and according to the latest Business Register and Employment Survey (October 2015), the total employment figure for the City of London is 414,600. Assuming that the day population in the above table is mainly additional people coming into the City to work, numbers have therefore dropped, probably reflecting the move of many financial businesses to Canary Wharf. 2) The public transport could convey such numbers speedily and cheaply from their widely distributed homes to the centre. I doubt that many of today’s commuters into London would consider we have a public transport system that conveys them speedily and cheaply into central London. The Barlow Report of 1940 was charged with looking into issues such as the geographical distribution of industrial workers and reported that it was not in the National Interest that a quarter or even a larger proportion of the population of Great Britain should be concentrated within twenty to thirty miles or so of Central London. A similar issue today with the widely held concern about concentration of population and economic activity within the wider London area. 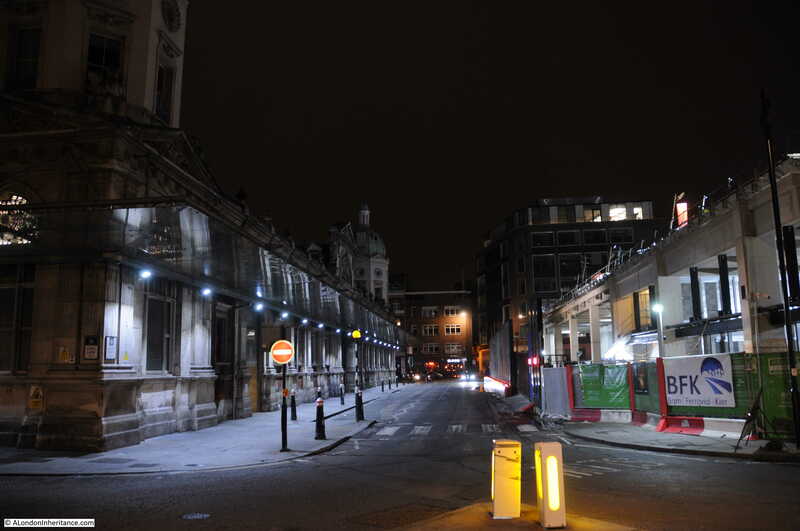 The reports also looked at opening up the areas around St. Paul’s. The following artist impression shows the proposed view from Bankside with the buildings developed to the maximum heights permissible under the proposed Overall Height Control. There is an interesting statement in the report which reads “Nearly a quarter of the City has been rebuilt since 1905, the new buildings producing about £4,000,000 or 42 per cent. 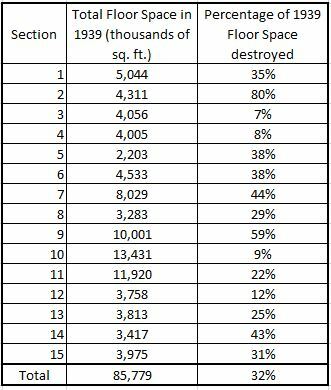 of the rateable value in 1935.” This highlights that almost 25% of the city had been rebuilt in the 30 years between 1905 and 1935 – it would be interesting to compare between 1986 and 2016 to see if a similar amount, but it does demonstrate that the City of London has always been under a process of considerable change. 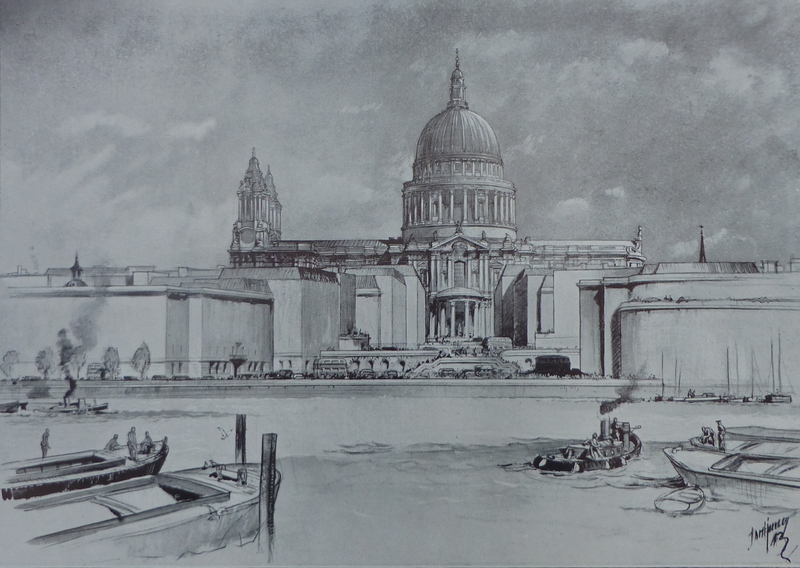 The drawing below shows the view from the same position as the above photo if the proposals of the report were carried out to open up the space around St. Paul’s Cathedral. The following drawing shows the proposed view from the east with the view of the Cathedral now open. The small church in front of the Cathedral is St. Augustine and the report comments that it assumes the church is restored – it was heavily damaged by bombing during the night of the 29th December 1940. The following is the proposed view of St. Paul’s from the corner of Shoe Lane and Fleet Street, looking up Ludgate Hill. The rail bridge running across the bottom of Ludgate Hill is shown shaded to show the impact of the removal of the bridge (one of the recommendations of the report) and how this would open up the view of the Cathedral. The report also contains a large number of maps detailing the proposed schemes and also key information about the City. 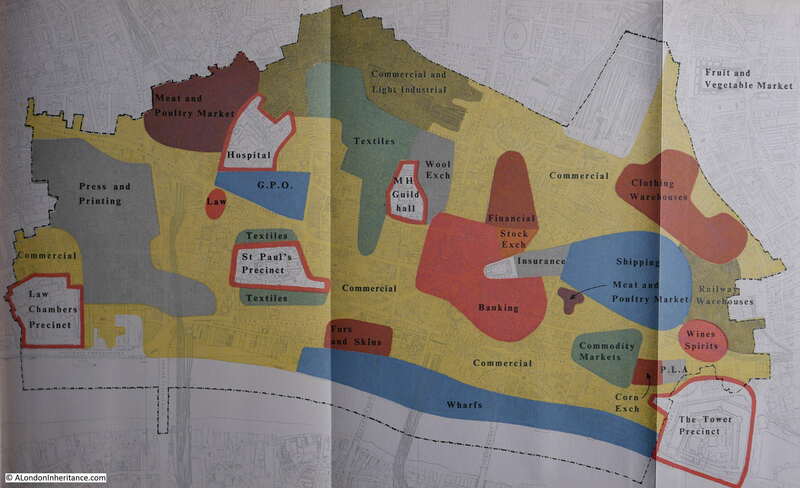 The following map shows one of the proposed schemes of an Embankment running along the foreshore of the Thames. 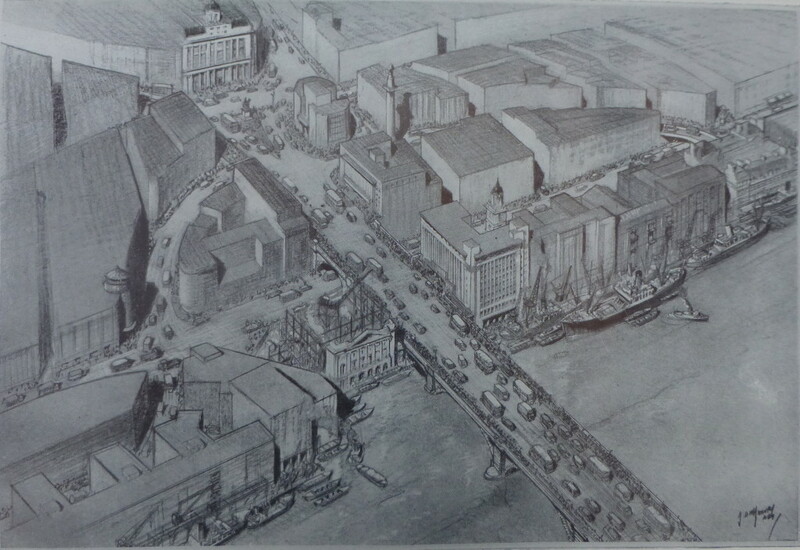 This was planned to be an 80 foot wide ring route around the City that would take traffic from the end of London Bridge to meet up with the existing Embankment just past Blackfriars Bridge. 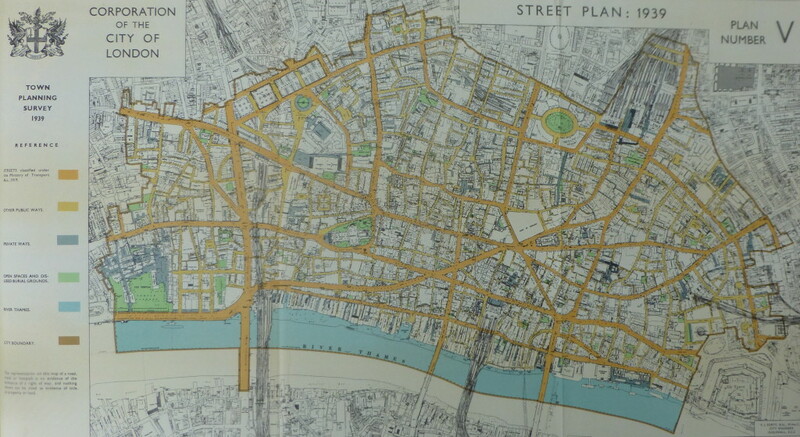 Whilst the river Embankment did not get built, the southern ring route did get constructed in the form of a wider Upper and Lower Thames Street. 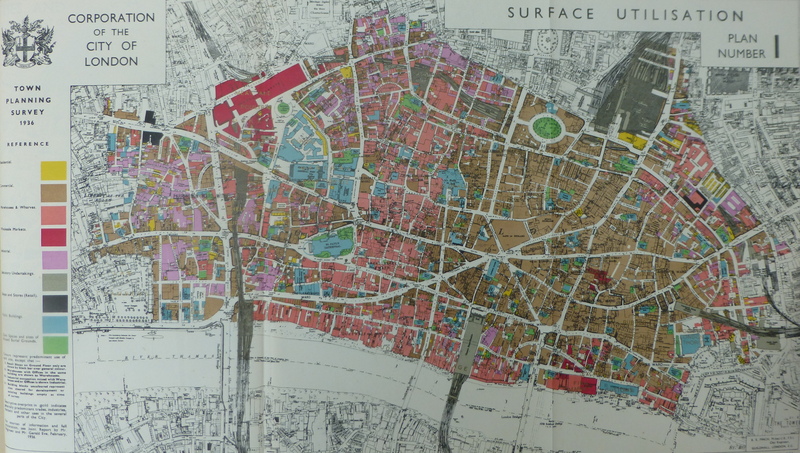 The following map shows “Surface Utilisation across the City” in 1936. 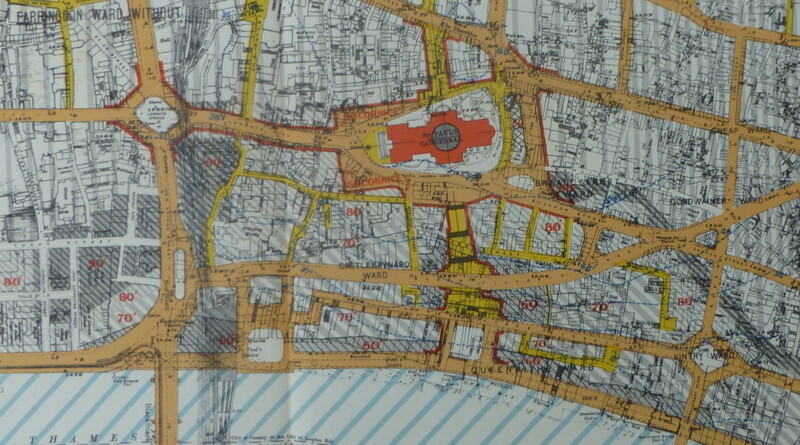 The map shows how much of the city was comprised of Warehouses and Wharfs. Not sure how to describe the colour, but it is the pink / salmon colour to the right of St. Paul’s Cathedral showing Warehouses and Wharfs all along the river frontage, up past the Cathedral and up to the area now covered by the Barbican estate. The Commercial space was centered just to the right of the Bank of England. 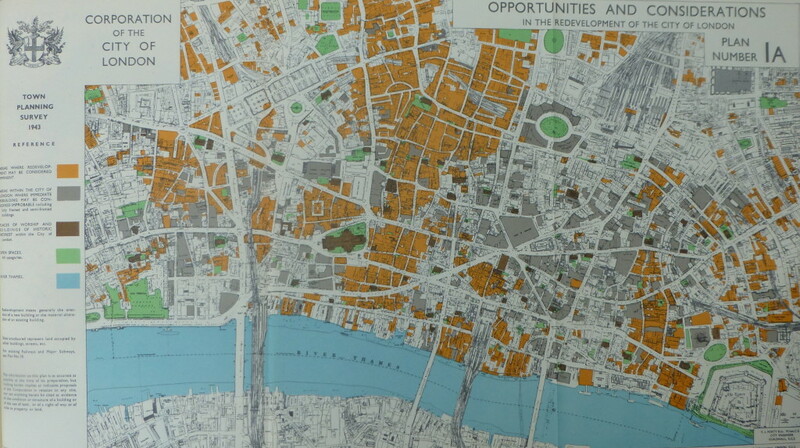 The next map is titled “Opportunities and Considerations in the Redevelopment of the City of London”. The area in orange is where redevelopment may be considered imminent and shows the areas which suffered significant damage during the war, where rebuilding of the pre-war buildings was not considered worth while. This map shows “Existing Railways and Major Subways”, colour coded to show overhead and surface, open cut, cut and cover, deep level railways etc. Note the green lines crossing the river at bottom left. This is the Waterloo and City Line between Waterloo Station and the Bank Station. The next map shows the “Heights of Buildings” in 1936 and shows how relatively low rise the City was at the time. 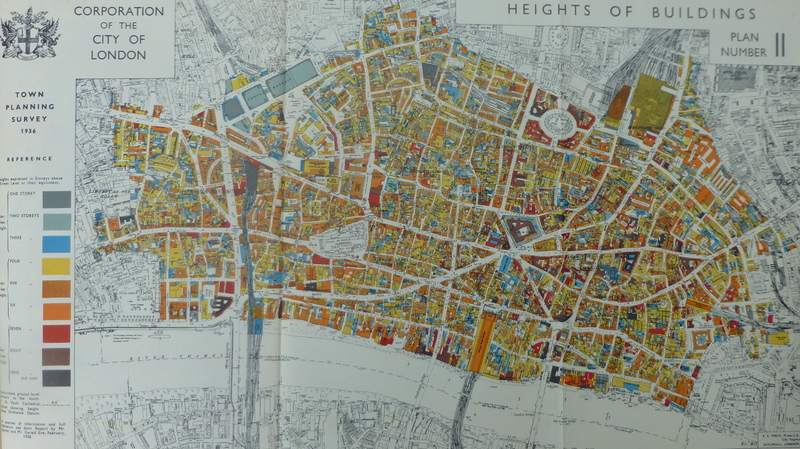 Black is the highest colour in the map for buildings of nine storeys and above. There is very little black to be found. How different the City would be 80 years later. 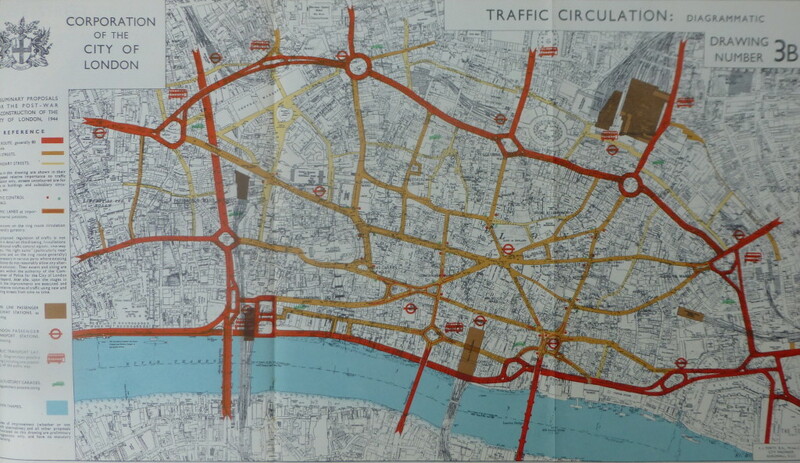 The bold red lines in the following map are a clever way of providing information on Traffic Flow across the City in 1904 and 1935. The width of the line represents the number of vehicles per day, 1,000 for the thinnest line up to 15,000 for the most thick lines. Darker red is for 1904 and light red is 1935. The small dark green blobs represent Traffic Control Signals and if I have counted correctly, at this time there were only 17 sets of traffic signals across the City. 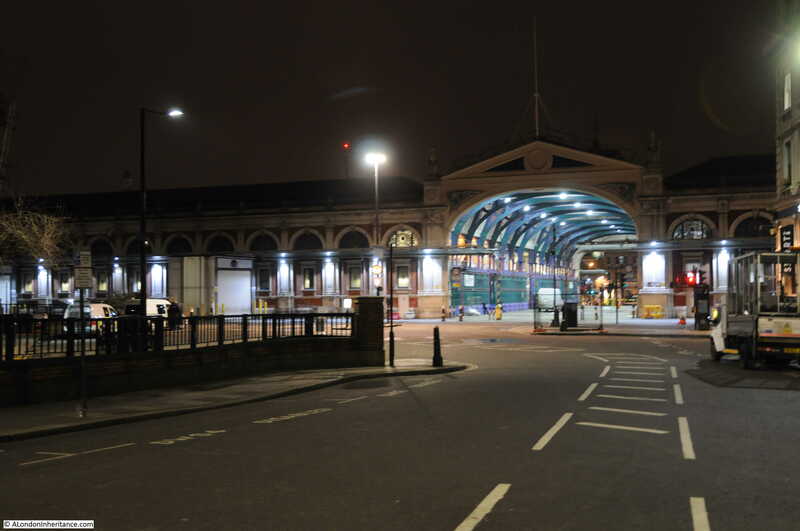 According to an ITV news report, in 2015 there were 105 sets of traffic lights across the City. 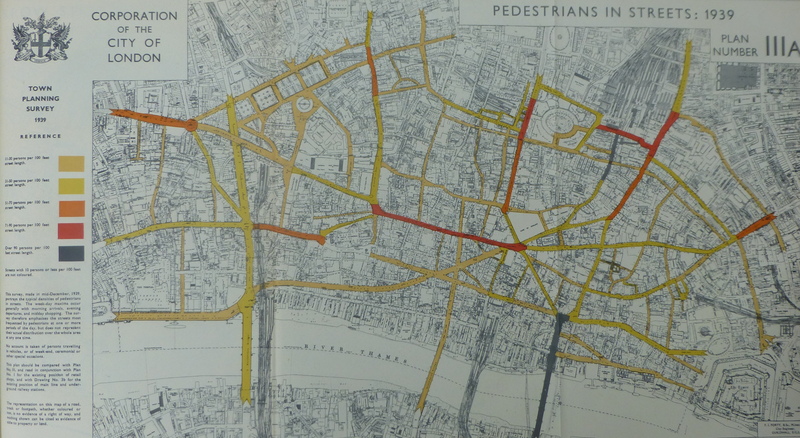 A survey in mid-December 1939 of typical pedestrian densities in the City resulted in the following map. Densities range from 11-30 persons per 100 feet up to 90 persons per 100 feet represented by dark grey. There are only two areas on the map with the highest density. One is across London Bridge and the other is from Liverpool Street Station down Old Broad Street, clearly highlighting the main routes for commuters to walk into the City. In 1939 there were still many narrow streets across the City. The following map shows streets of less than 30 feet wide between buildings and containing a carriage-way marked in orange. It would be very interesting to compare the following map with one with the same classifications today. This shows the street plan with street classifications, city boundary, open spaces and private ways. 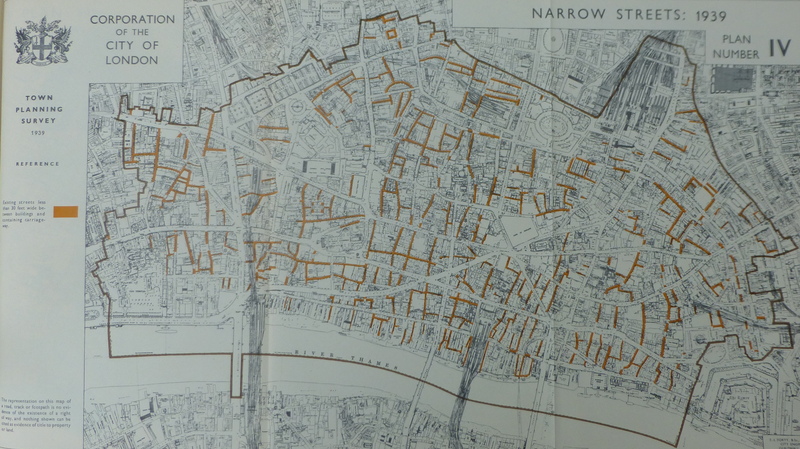 Private ways are shown in a grey / blue colour – I suspect that there is very much more land classified as private way across the City today. The following map brings together the “General Proposals for Land Use Zoning”. 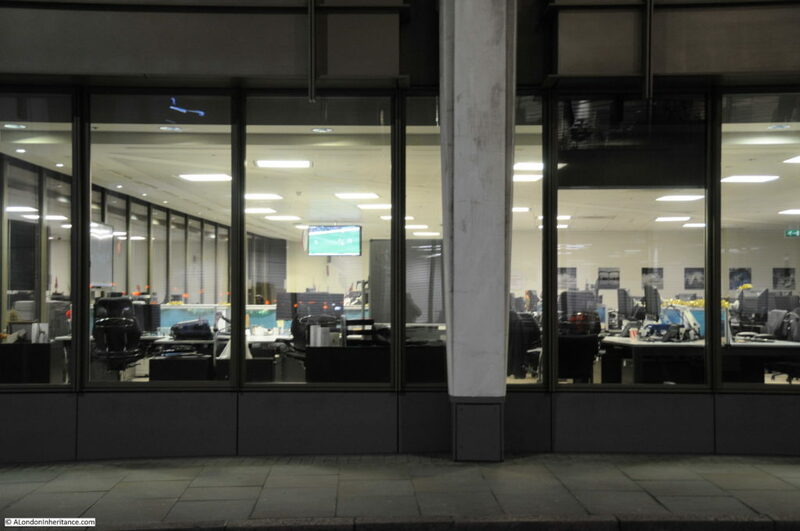 The core of the City, around the Bank of England is still allocated for offices with much of the rest allocated to General Business. The land marked in red is the “Minimum acquisition of land required for street improvements”. There is also a map showing the “Height of Buildings Zoning”. I have shown below an extract of the map from around St. Paul’s as this shows the height limitations to maintain a view of the Cathedral from across the river. A height of 60ft raising to 80ft to maintain a clear view. The map text emphasises that this height is inclusive of architectural features so it really is an absolute height limit. The final map is showing proposed “Traffic Circulation”. The roads marked in red are new, 80ft wide streets that would carry traffic around the City. 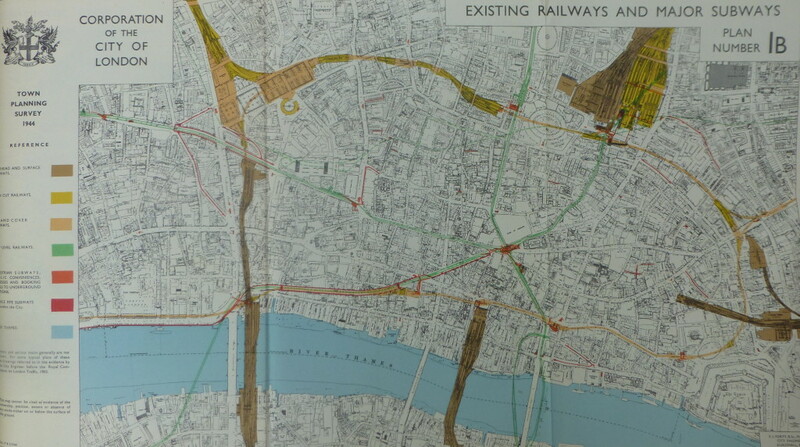 This again shows the proposed extension of the Embankment from Blackfriars almost to London Bridge. Really surprising that this was considered as it would have considerably changed the river frontage along this part of the City and would have damaged the Queenhithe Dock which is now a scheduled monument under the 1979 Ancient Monuments and Archaeological Areas Act. The map is also predicting the rise in car ownership and the resulting need for car parking. Eight green car symbols across the map indicate the possible siting of multi-storey garages. Many of the reports recommendations were put into place. 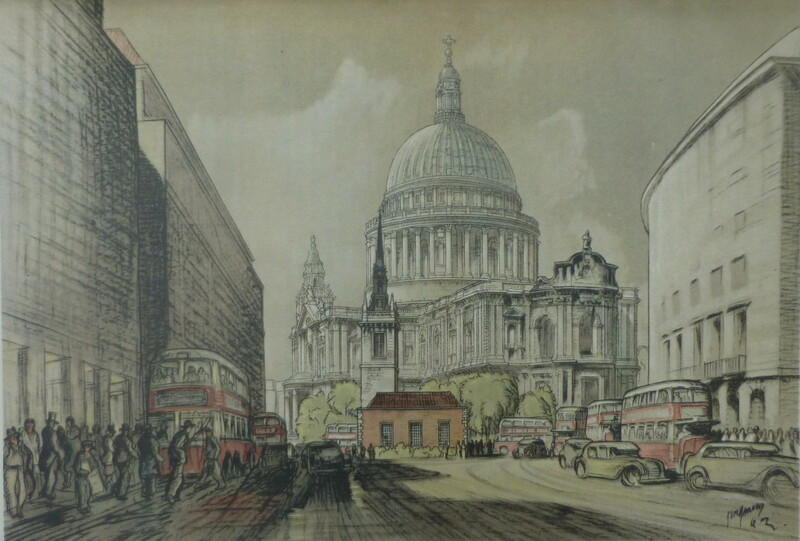 The area around St. Paul’s Cathedral today looks very similar to the artists impressions. 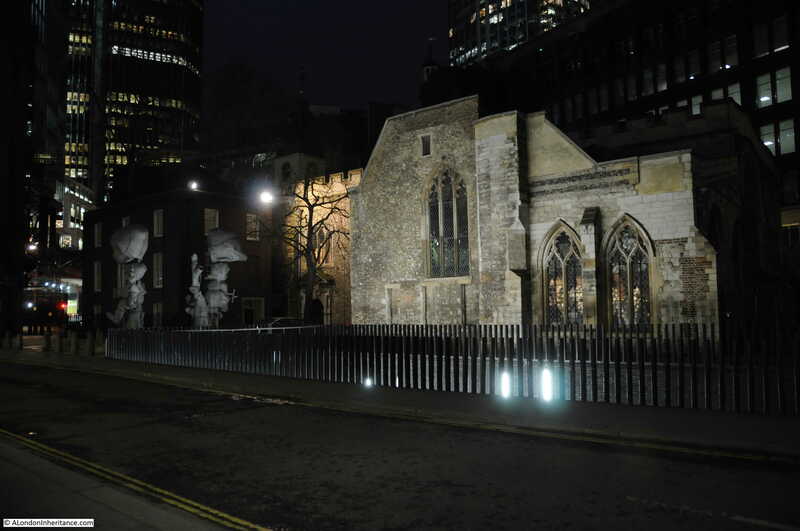 Buildings that originally ran up close to the churchyard have not been redeveloped and the Cathedral now has a much larger area of open space, particularly to the south and across to Bankside, to open up and protect the view. Fortunately, the proposed extension of the Embankment to London Bridge did not take place. This would have dramatically changed the City’s historic waterfront. The report did mention this concern and also included suggestions such as a tunnel. In the event, Upper and Lower Thames Street were widened to provide a southern ring road around the City. The working population of the City did not continue to grow and has since reduced due to the move of many typical City jobs east to Canary Wharf. I suspect that many of the pedestrian densities are much the same today as they were in December 1939 with large numbers of people continuing to walk across London Bridge and into the City from Liverpool Street Station. The report makes fascinating reading and I hope to cover more in the future. The maps shown above are just a sample and for these alone, the report is a remarkable document. This entry was posted in London Books and tagged City of London, Reconstruction of the City, River Thames on January 31, 2016 by admin.